Ignore my name at the top of this post. (We still haven’t worked out how to add an author.) This weeks’s post was written by my co-author and colleague Isabel Hernandez who is continuing her work on the cinemas of Kensington and Chelsea. I mentioned in my last blog post that I might revisit the cinema theme and see what I could find in our collection for The Kensington Odeon. Given its fairly recent closure I wanted to acknowledge its history and presence on the High Street for the best part of 89 years or so. Not old by historic standards, but certainly not dull. The Kensington Kinema opened on the 6th January 1926 on the site of what was 8-13 Leonard Place – a range of houses that existed between Earl’s Court Road and Earl’s Terrace along the High Street. The redevelopment of this part of the High Street was completed around 1930-31 with shops and flats erected on the site alongside the cinema. 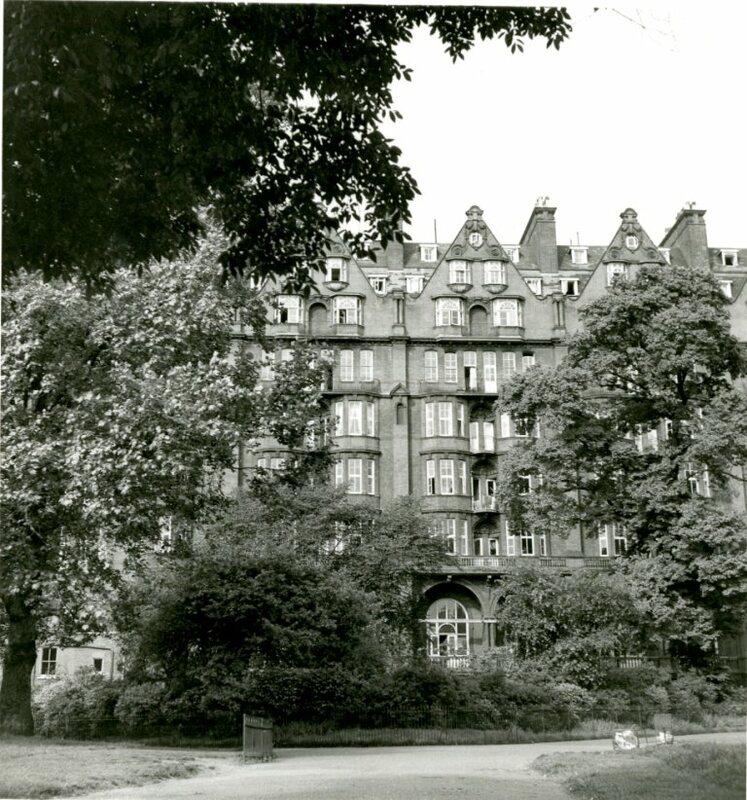 The Kensington was designed by one of the foremost cinema architects of the day, Julian Randolph Leathart, and his partner, W F Granger; experienced men in their field. 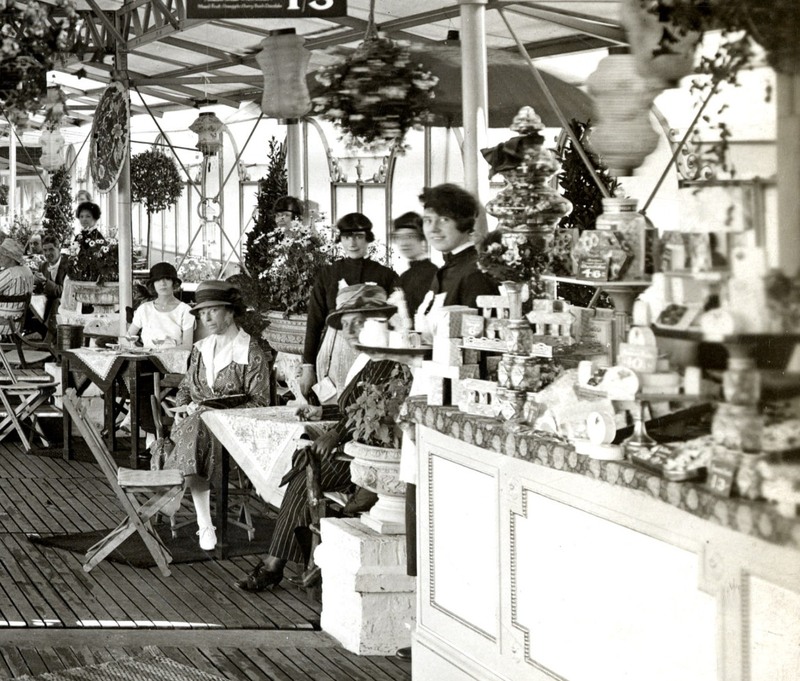 The owner was Joseph T. Mears, a builder by profession, and President of the (then) Cinematograph Exhibitors Association. It was the first of four cinemas in his collection. Certainly you can clearly see Greek and Egyptian influences when you look at these old images. Ideas for the cinema’s construction were being discussed from as early as 1921, but there was considerable opposition to this which delayed construction until 1923-24. 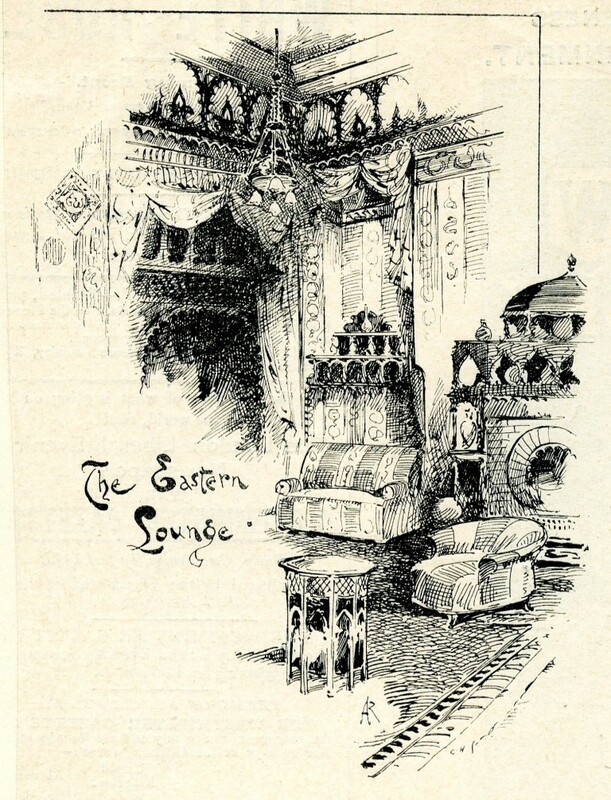 However, the encouraging design was well received in architectural journals and eventually it won over the sceptics. The result was the creation of one of the largest cinemas in Britain. 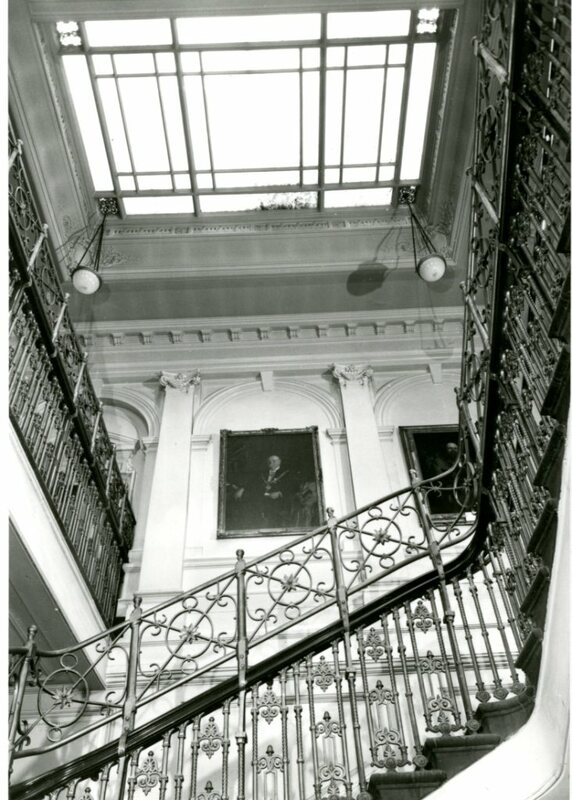 The Kensington was constructed with a steel frame (much like the Kensington Central Library) with vertical posts and horizontal beams to carry its weight. Steel frames are nothing unusual now where buildings are concerned, but it was a rather modern technique to include in the assemblage of a cinema building of that time. The opening of the cinema was successful. The new building even had the unique privilege of having its own tune. A music composition by Charles Williams to commemorate the opening was played. It was succinctly called: The Kensington March. A few passers-by and a policeman in the forefront of the image below is a good way to gauge perspective. The building does look like a temple. 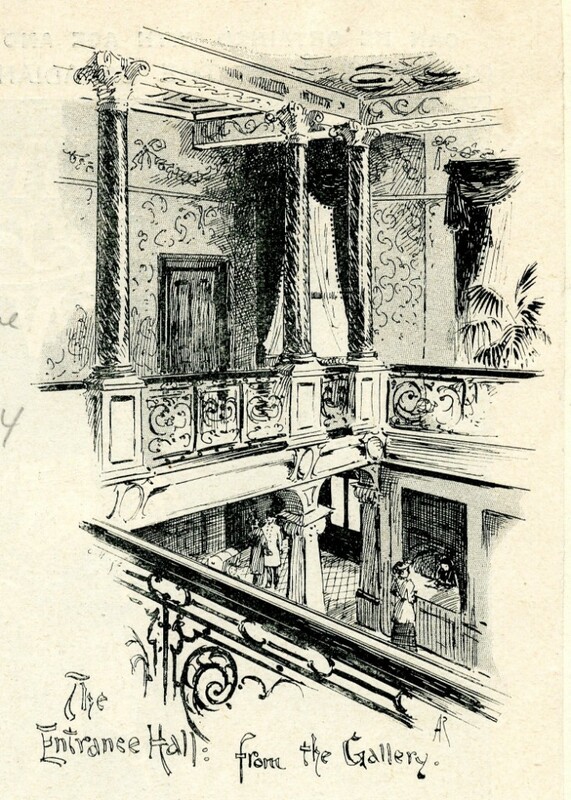 It is interesting to note that as elegant and impressive as the cinema was at the time, there appears to be very little if no film publicity on display, giving the building a conservative reputation. On first appearance it doesn’t appear to convey the vitality that later cinemas exuded with pomp, promising visual entertainment unlike anything else at the time. Perhaps with only one major screen, very little open advertising was required. As to how you would know what time a film was to start is a mystery to me. It seems that films were usually run on a continuous loop throughout the day and it was perhaps by chance that you would catch a film from the beginning. Early adverts would appear to show that performances were continuous. Obviously, this later changed with the Odeon’s gaudy advertising as I remember it, so you could say it is a matter of opinion what it is that one prefers with regards to information. Most of us will remember the display board that was attached to the facade of the building. It was rather unattractive and not in keeping with the good-looking building, but as a cinema it was recognisable and informative. Whether you were walking by or sitting on the top deck of a bus, you could see what was advertised. If you’ve read my previous blog post on the Westbourne Grove Odeon you will remember I mentioned that Oscar Deutsch, who founded the Odeon brand, was very much a man who liked to advertise his cinemas extrovertly, including the use of neon lights with some buildings. 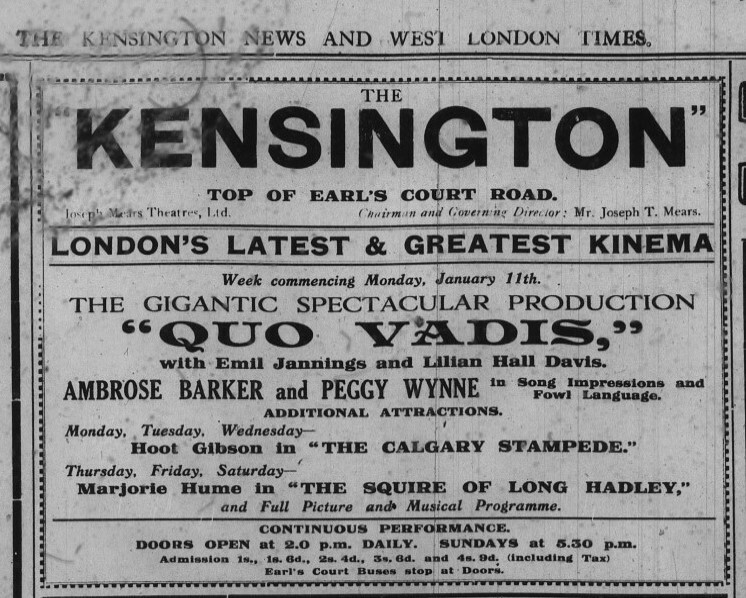 In the case of The Kensington, it would appear initially that advertising was left to the local newspapers. In fact, newspaper and magazine listings were still the best form of information right up until the internet took over from printed material. Below is the only clue I could find in the local newspapers of the time that there was a new cinema in town. The first film ever shown at The Kensington was Quo Vadis. 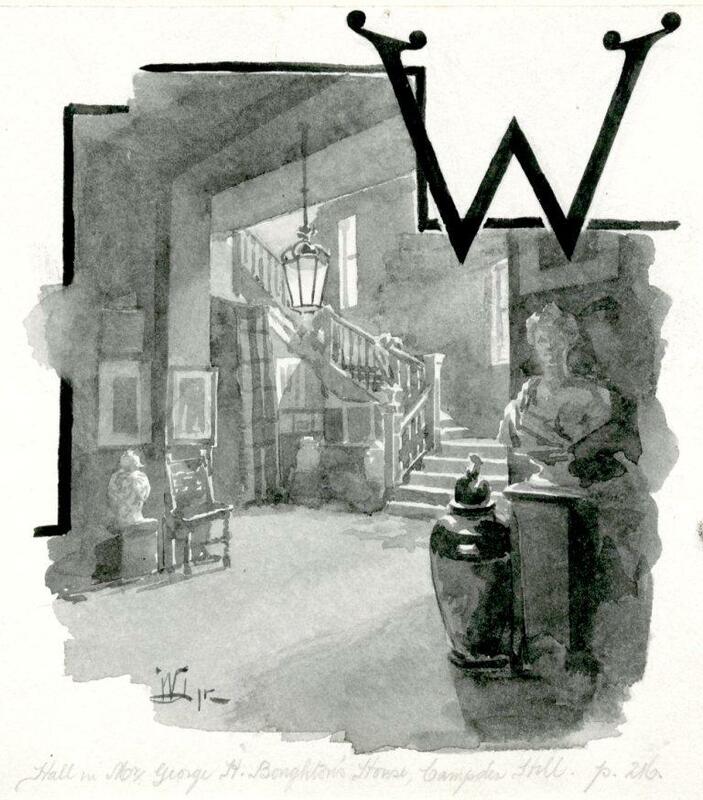 It was advertised on the 8th January 1926, in the weekly Kensington News and West London Times. Two of my more interesting finds in the collection were these architect’s plans for the cinema. 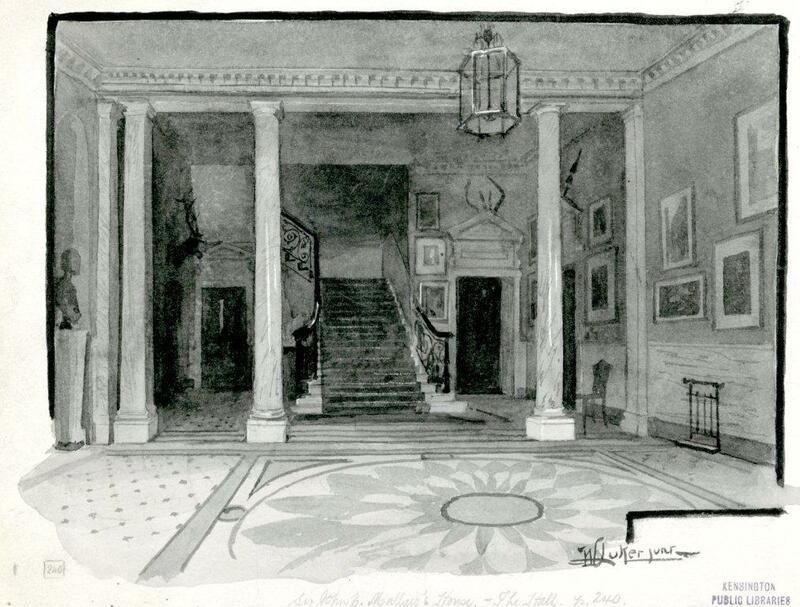 I often think that some plans are works of art in their own right, so I always enjoy scrutinizing the intricacies of the drawings in some cases, even if I’m not wholly versed in the architectural details. These are not originals, yet interesting nonetheless. 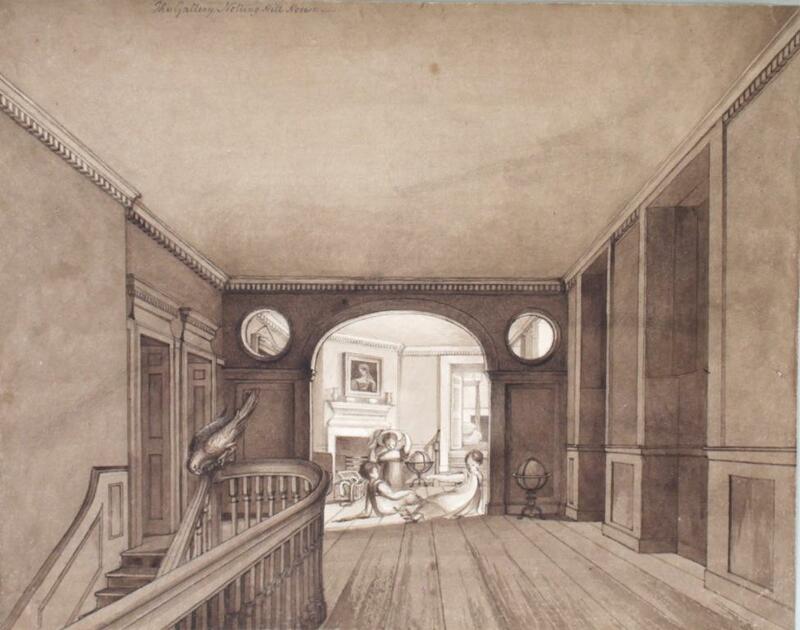 Another plan showing the proscenium opening where the screen is located and interestingly, the five levels of the cinema: the billiard room in the basement; the entrance hall; the tea room; the lounge and the roof gardens. A large entertainment establishment for sure! The auditorium was decorated in a Neo-Greek style. I think of it as new antiquity. According to the Kine Weekly 1926, the furnishings were colourful, decorated in warm hues ranging from amber to red to warm grey. The terracotta murals and carpet also added to the welcoming atmosphere of this spacious cavern and it was said that the screen never presented a distorted view no matter where you sat. 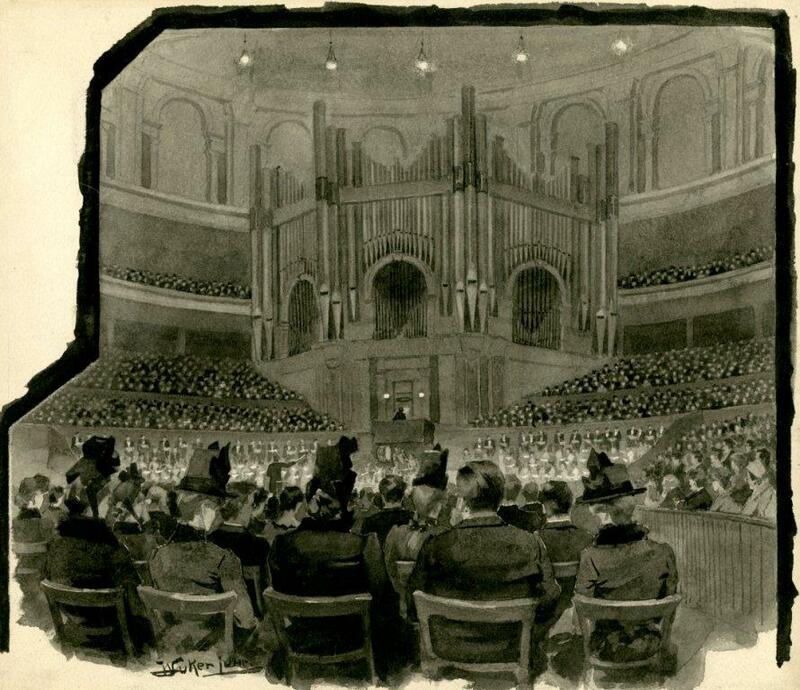 Something of a boast considering how large the auditorium was. The curtained screen below in regal repose until the next show. Below you can see the stalls and balcony, or circle if you prefer. You would be forgiven for thinking this was a large theatre, like The London Palladium, only slightly bigger. 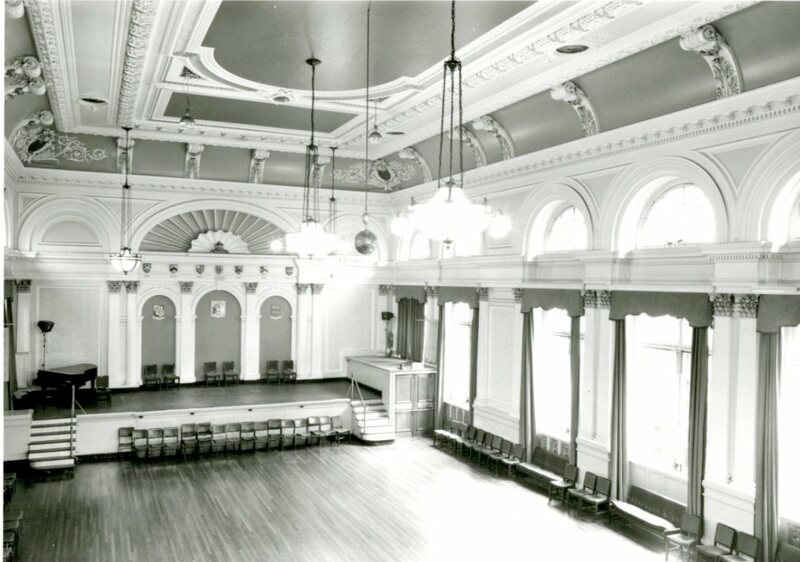 The Kensington was sometimes used as a venue for other events, such as: variety performances, concerts, award ceremonies, premieres, even an exhibition held at the cinema in 1959 called “Better Towns for Better Living”. Its multiple usage was always a boon for the local community. Below is the elegant tea room with its art nouveau decor. Tea rooms have always been a staple of British social life since they were established in the 18th century. They came after the coffee houses of the 17th century which were places for social discourse and debate (usually men only). Tea, on the other hand, was very much the prerogative of the elite. It was very expensive and heavily taxed in that early period, which lends a whole new meaning to Tetleys and PG Tips. 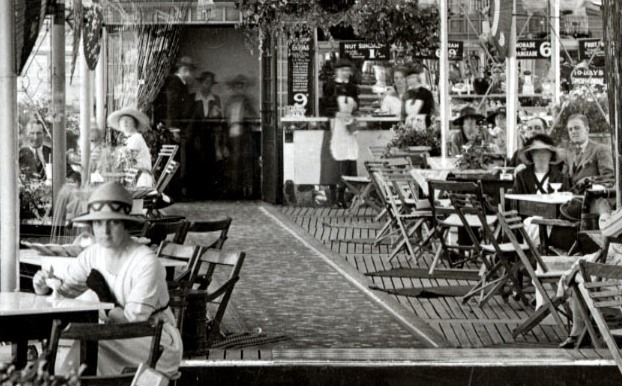 Fortunately, tea rooms later became a lot more affordable and considered reputable public spaces that women could frequent. Such egalitarian notions must have seemed avant-garde at the time. Below is an original poster I found advertising the cinema programme for Christmas Eve 1934. On the other side of the poster I was surprised by this rather interesting drawing, dated January 11th 1935. Rather than throw the poster away, it would seem it was better utilised as a doodling sheet. And why not? Perhaps this was the anonymous artist’s pet dog. It’s not every day one sees an elephant on the High Street and probably just as well. This image was taken around the 1950’s. National Savings was being publicly encouraged. It provided an easy and safe way for ordinary people to save small sums of money. The Kensington cinema changed its name to The Majestic in July 1940; a wartime security measure to prevent the enemy from identifying locations within the London area. In January 1944 Odeon Theatres Ltd acquired The Kensington, bringing it into the fold of one of the largest cinema chains in the country. It reopened as The Odeon on the 9th October 1944. Later, in 1976 the Kensington Odeon underwent a refurbishment that upgraded it into a triple screen cinema. 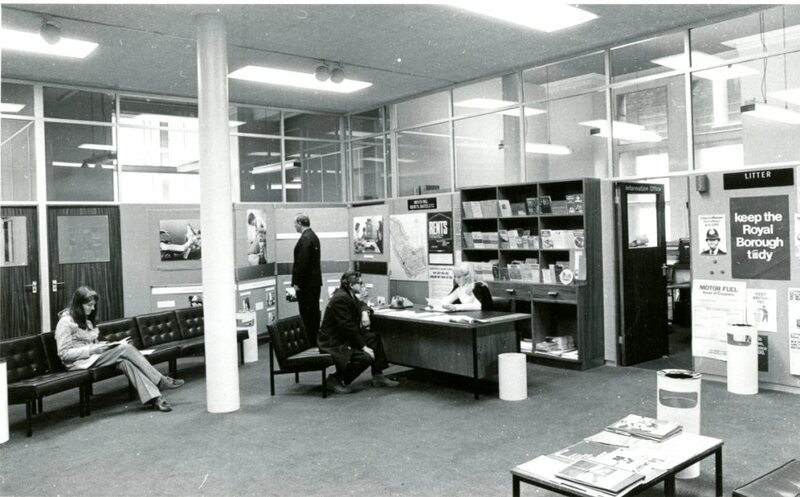 The image below shows the cinema around 1967, before the change. Only one film is advertised: The Deadly Affair, based on John Le Carre’s first novel, Call for the Dead. The recognised symbol of the-man-with-the-gong (Arthur J. Rank Ltd) can be seen on both ends of the display board. Fancifully, I look at that now and see a portent of the future being sounded. 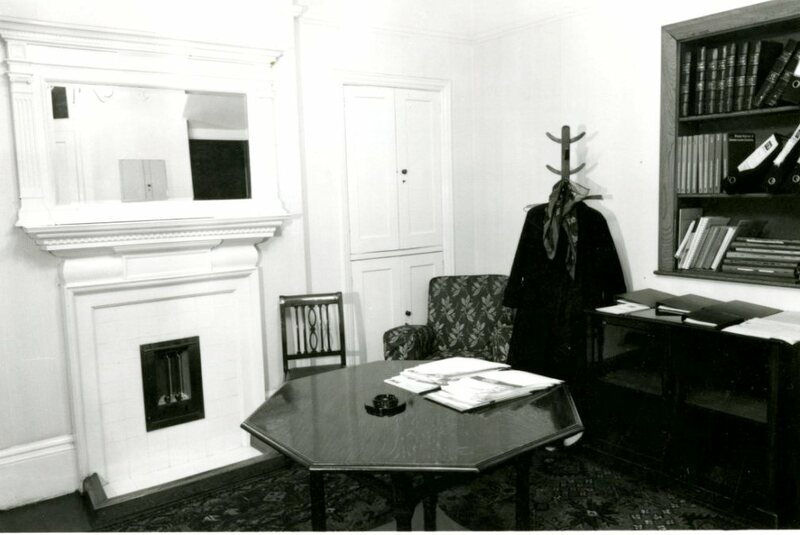 In 1980 a further screen was added. And by 1991 two further screens made it into a six screen multiplex. Not a cinema to sit on its laurels the Kensington cinema upgrades were all attempts to maximise audience attendance allowing for variety and choice. But it was never the same. Just like most other picture palaces, something of the original quality of the cinematic experience was lost. Unfortunately, much of the internal design of the cinema was altered through the decades after various refurbishments. 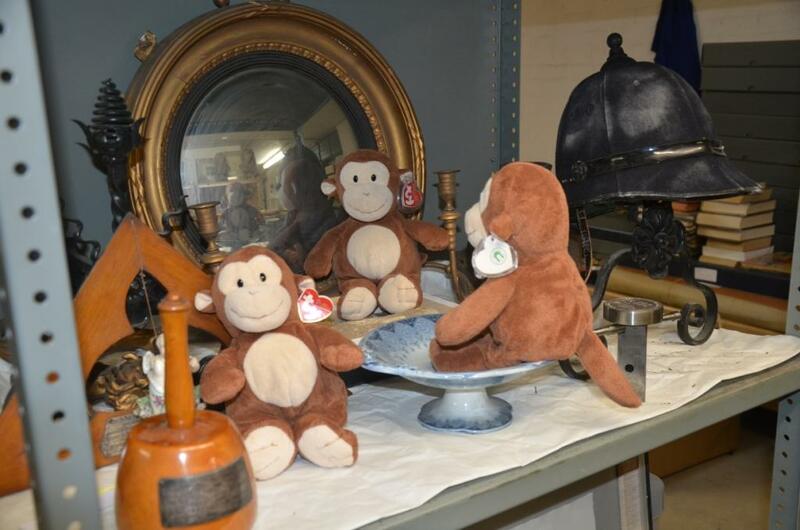 So much so that it would appear much of the original decor was subject to damage, even if some of it was still intact. A short-sighted, cavalier attitude towards something so interesting. In July 1998 the Odeon underwent yet another refurbishment. By this point the once grand auditorium was no longer visible. It was reputed to have been the largest built in England, and yet not immune to the many changes over the years. Original details still remained around public areas like the main staircases, but overall the original design was mostly buried beneath modern contrivances. In 2007, the RBKC gave planning permission for the cinema to be demolished retaining only the façade. It was hoped through a campaign led by the local community that the cinema should be listed as a heritage building and saved from ignominious obscurity. An image I took recently of the now defunct cinema on my phone of multiple talents. Looking at it I couldn’t help but remember all my visits to watch films there. And seeing it like that I felt perhaps sentimental about the change. It was, if you’re a more sanguine-natured individual, just a building in the ‘greater’ scheme of things. But that old nostalgia has a way of bringing out the history in us, and at the risk of being accused of personifying the building, it seemed to me, forlorn. The Kensington Odeon closed on 11th September 2015. Never to reach its centenery as a purpose built cinema. The redevelopment includes a six-screen cinema, along with residential flats. I stated earlier that there was a strong opposition to the closure and a robust campaign was begun with a view to challenge the developers and the council. Many in the community felt that they were excluded from the consultations which led to a rethink of the original plans. Still, the end result, after many years of uncertainty, has led to the cinema’s final demise. Its last curtain call, if you like. It has hosted celebrities, royalty, and best of all, those of us within the community who will remember it as it was for a very long time. Not just a building, but a High Street landmark – a disappearing way of life. Changes often do evoke strong feelings and unsurprisingly this includes anything deemed of historic import that is vulnerable to redevelopment. After all, we tend to form attachments to what we consider heritage or culture; our past. I suppose, in many ways, it gives us a sense of identity. Cinemas have come and gone over the decades. Closures are not a new phenomenon. Their former grandeur is much more sedate these days. Time sometimes has a way of transforming or diluting things in this way. I have already made the point about our evolving technology and the internet in my previous post, which has exacerbated the problem. Less people attend and less money is generated. Sometimes things simply fall out of ‘fashion’. But often we do not notice something is there until it is gone. On the one hand, if we don’t frequent the cinemas, then questions are asked as to their viability. Our changing habits do influence the existence of these places. The same can be said of libraries and museums in some respects. They cannot exist without people, or money. Cinemas can only upgrade to a point before the constant push of modernism keeps changing the script and that requires investment and innovation. Unfortunately, we also live in a world where profit and wisdom are often incompatible. Ideally we would welcome a balance that benefits society as a whole – perhaps I am naively utopian in my view. There is no doubt that life is ephemeral, no less the physical buildings we associate our past with. But I think sometimes we need to reconsider our complacency about anything, and more to the point, the tale of The Emperor’s New Clothes. I hope you have enjoyed looking at the images in this post. I initially thought we had very few for a blog post, but there were enough to show you. Thanks for reading! Dave will resume posting next week. I saw a tabloid story from 2017 about Prince William and Kate Middleton (as they were then) going to see The Avengers at the Odeon High Street Kensington. Rumour has it that Princess Diana took the much younger Prince William and his brother to see the Harrison Ford film Patriot Games there also. For myself, I went there to see the first Alien film, and took my future wife there to see Bad Timing. Isabel is right. Something has been lost with the passing of these big old cinemas. 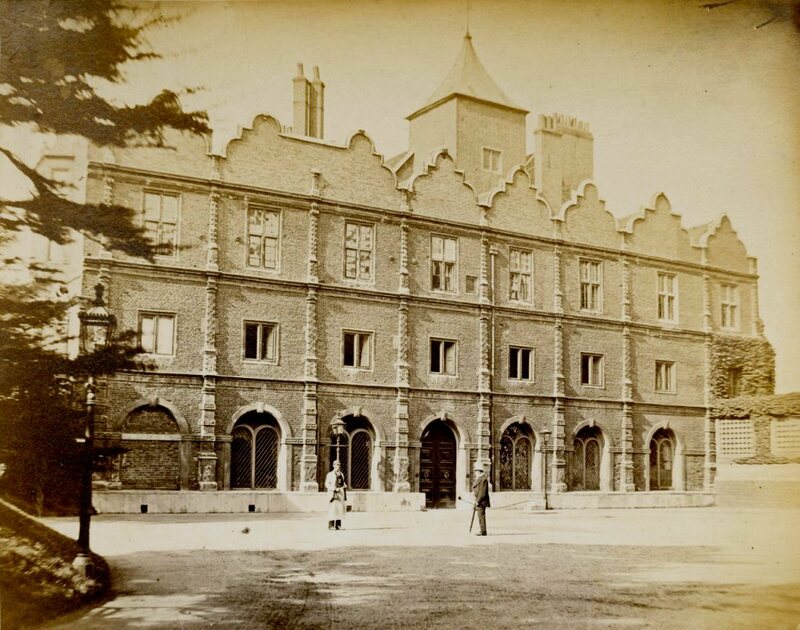 We caught a glimpse of the Royal Palace Hotel last week but it looked pretty dull and gloomy in that rather faded photograph, even though it was probably only a few years old. To capture the aspirational feel of a new hotel you really need promotional material and especially artwork. So, for the most part, we’ll give the photographs a week off. 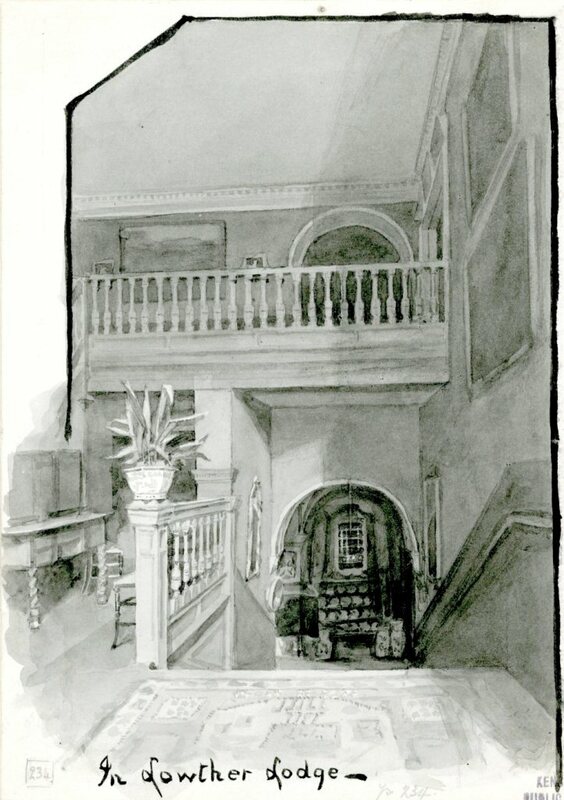 Here is a view from an architectural publication showing the grand design. 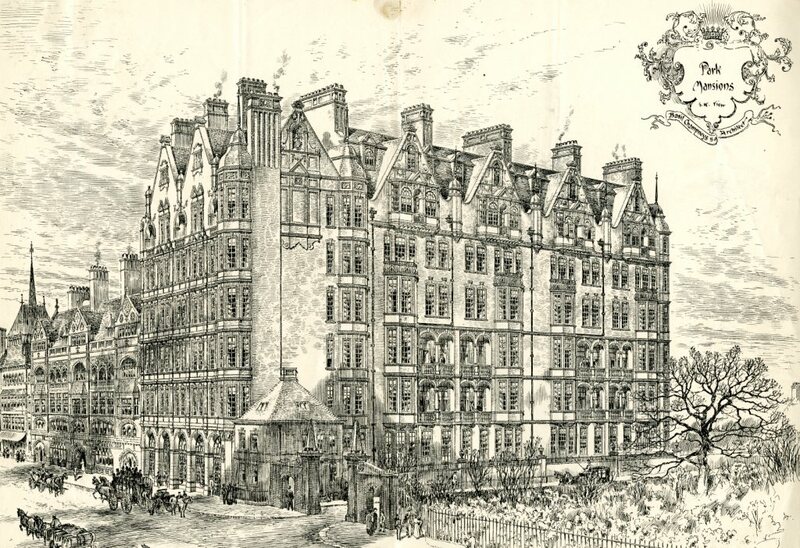 The hotel, built in 1892-93 was built on the site of the King’s Arms Hotel (basically a large tavern) but was a far more ambitious building, towering over the surrounding houses and shops and looking down on Kensington Gardens. It was intended to serve the growing number of visitors to London, and entice them in with many modern features, such as the grand entrance. This week’s pictures are all illustrations from a contemporary periodical The style reminds me at least of William Luker. 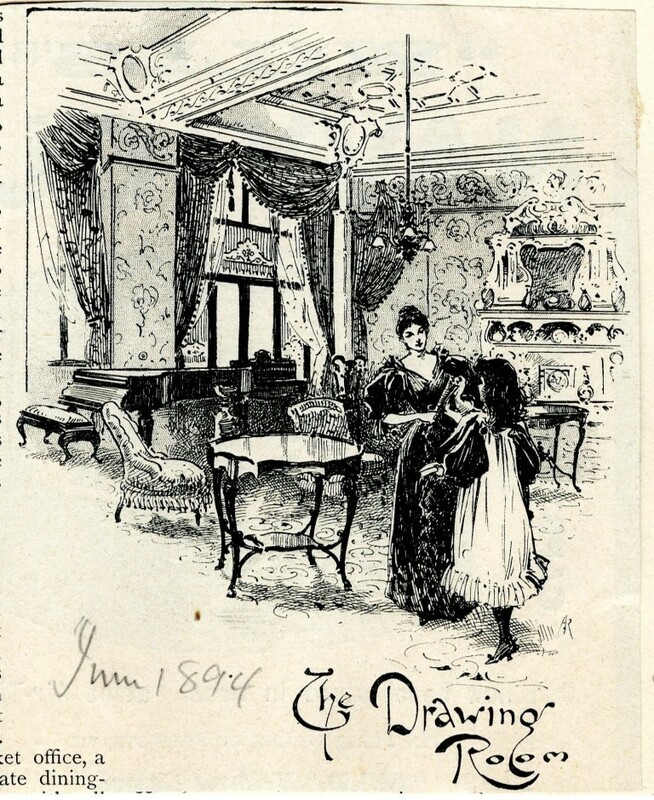 In the 1890s it was still somewhat easier for magazines to use artists to portray scenes like the exciting interior life of a brand new hotel. 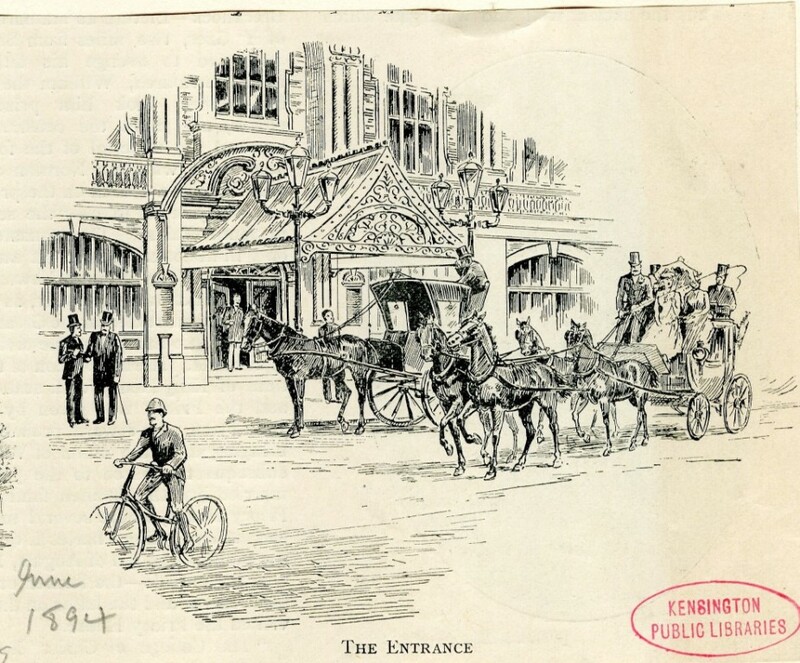 An elegant woman glides through the entrance hall on her way out for a promenade through fashionable Kensington. 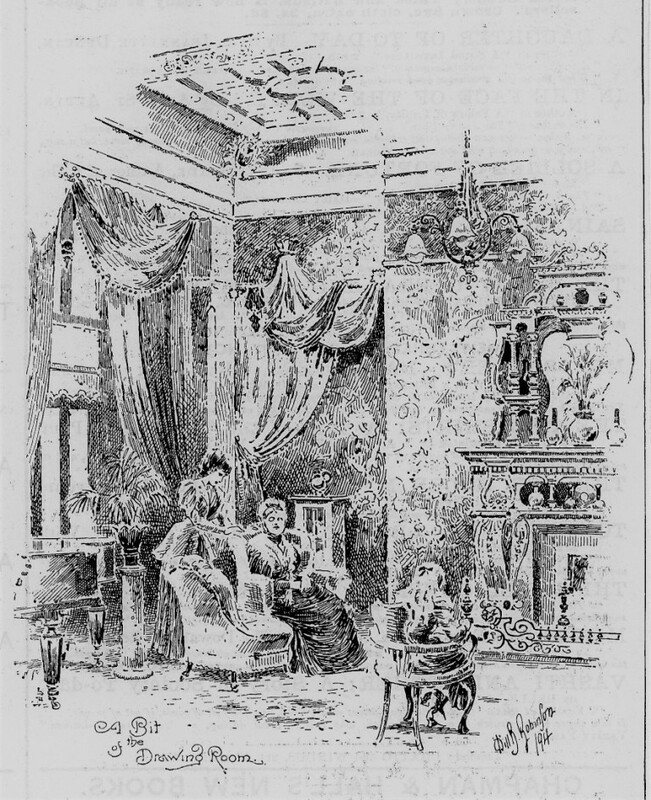 A gentleman reads a newspaper in the hall. Not an aspidistra perhaps, but some kind of giant fern. Below another view of the entrance hall, looking down from the gallery. Guest linger in the sumptuous public areas of the hotel. 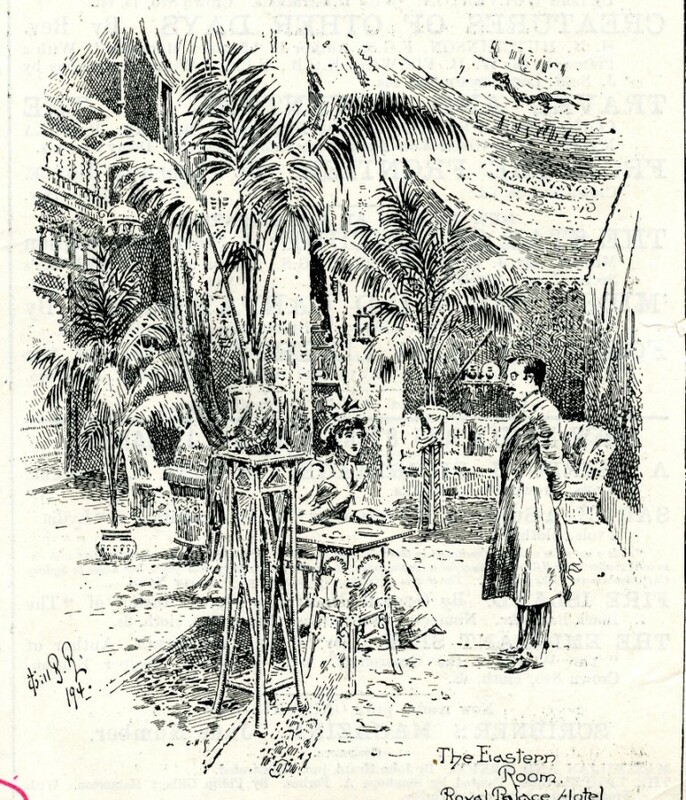 Or this one, an “eastern room” another young woman chats with a gentleman in formal dress, under a kind of canopy, surrounded by more of those giant ferns. Guests could dine in a variety of dining rooms, some of them small and intimate. Other larger, and more grand. 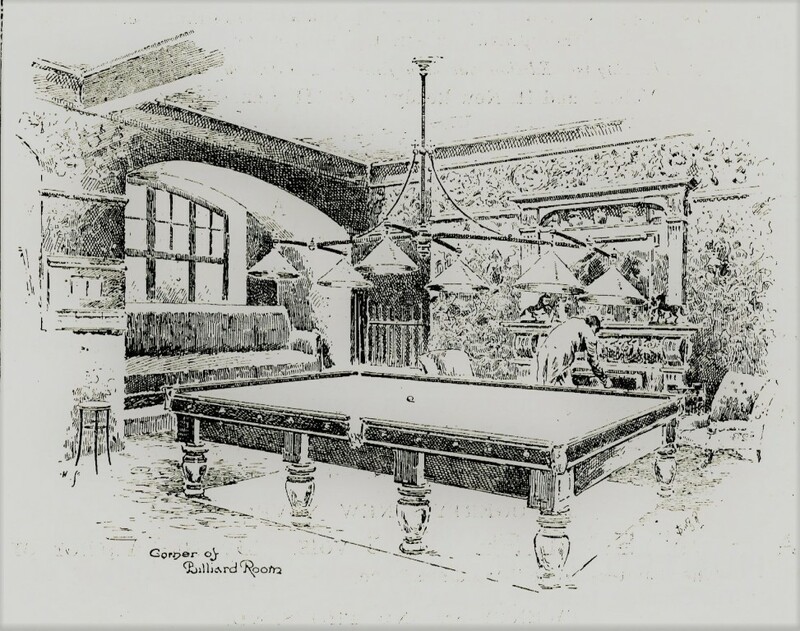 There were also the usual convenience of London life, such as a billiard room. 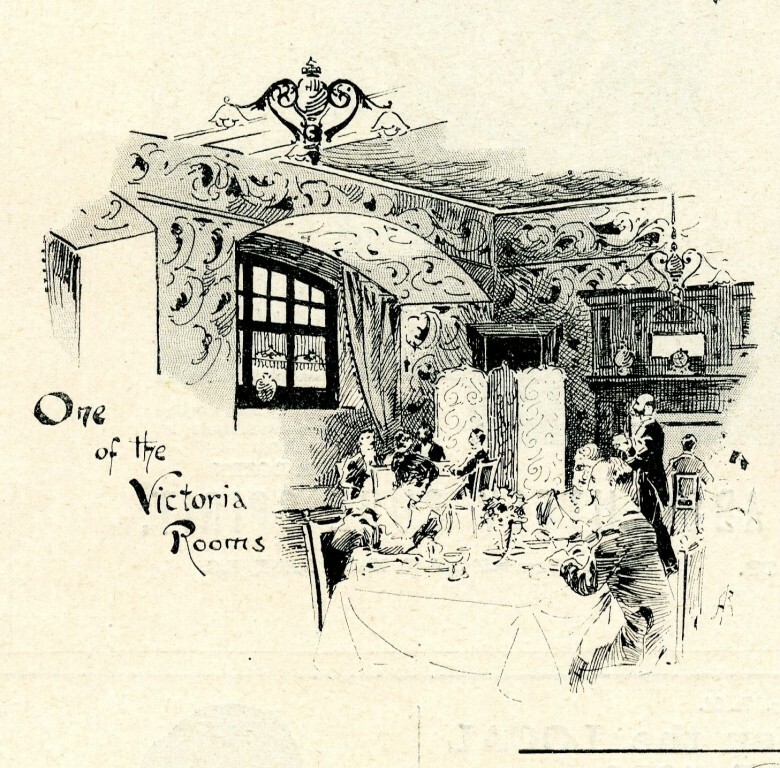 One of the features the hotel was most proud of were the extensive suites where residents could effectively have their own apartments, with private sitting rooms. The husband sits around with a newspaper, while his wife concentrates on looking good. Below, a family group are actually making themselves comfortable and settling in in front of a warm fire. 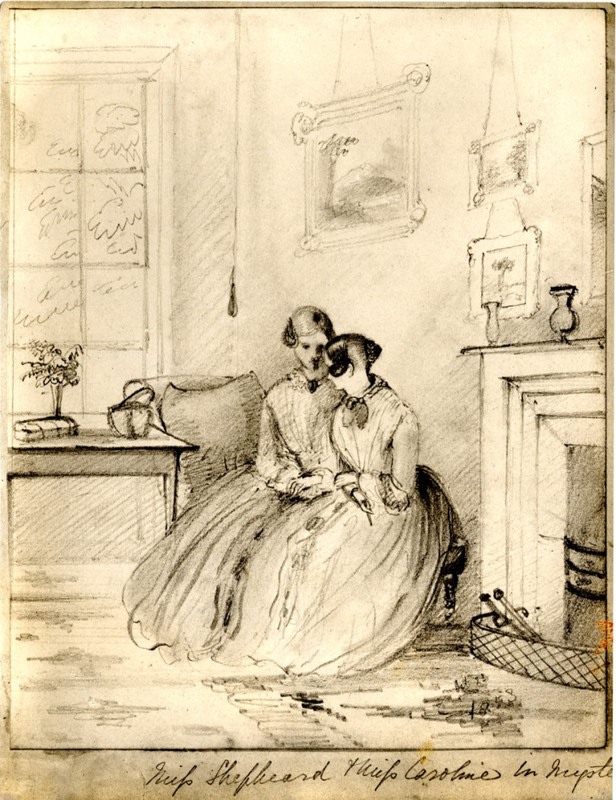 In a private drawing room, a mother and daughter spend some quality time together. I’m not quite sure what they’re doing. Perhaps the girl is insisting she should be wearing something more fashionable now she’s quite old enough to wear adult clothes. Maybe her mother (or is it an older sister?) is quietly asserting that she’ll just have to wait. 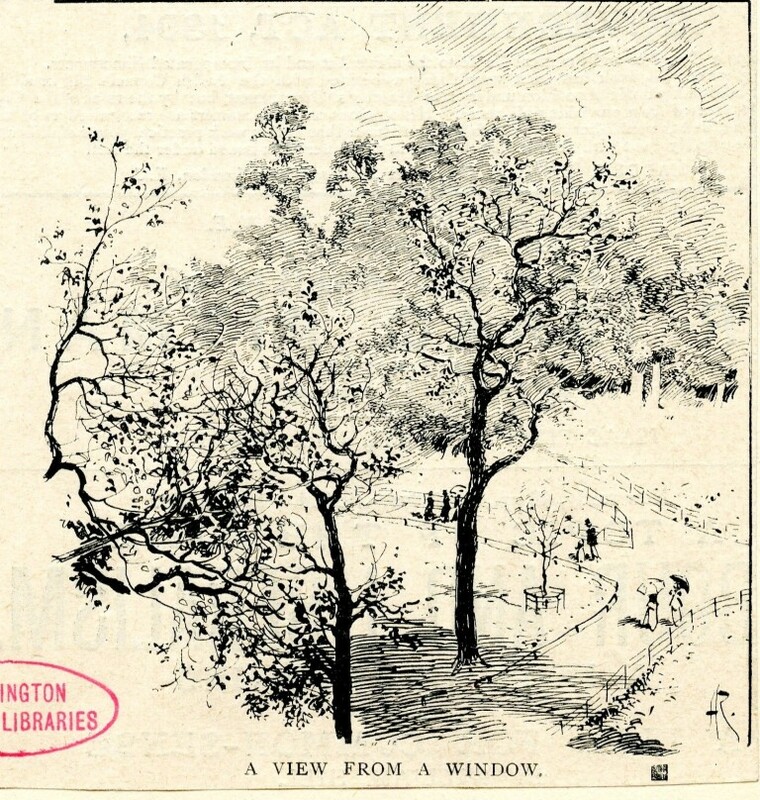 There’s a nice view out of the window of course, and they can go walking in the Gardens as often as they like. I could refer them to Mr Luker’s pictures of Kensington life, or some postcards of the Gardens. After an outing, it’s only a short walk back to the wondrous hotel. It’s conceivable that the young lady might live to see this view in her old age. 1958. The Royal Palace Hotel looks intact, and still looks tall and elegant through the trees. But, if not actually empty at this moment, it didn’t have long before the end. 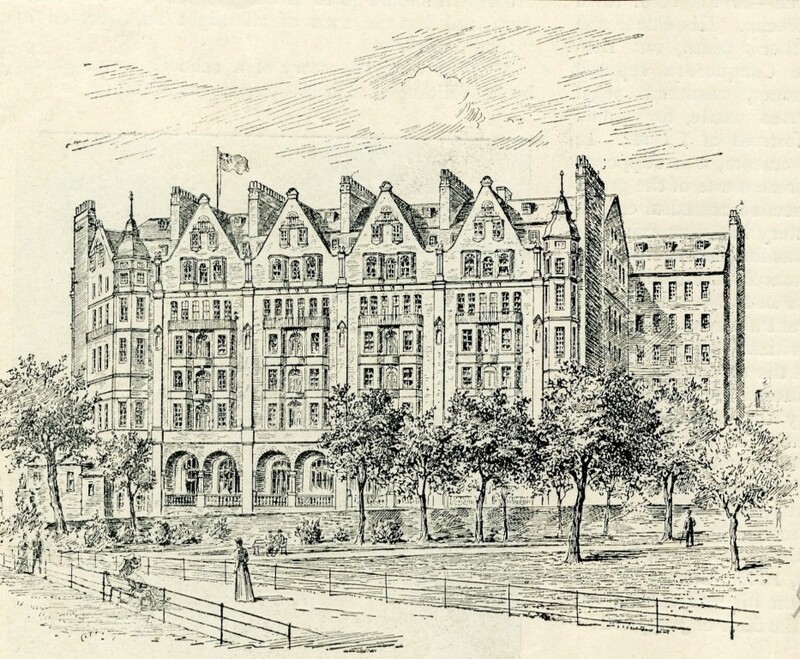 It was demolished, and a larger hotel built on the site with a new name. We have a few pictures of that process but I’ll save those for another time. 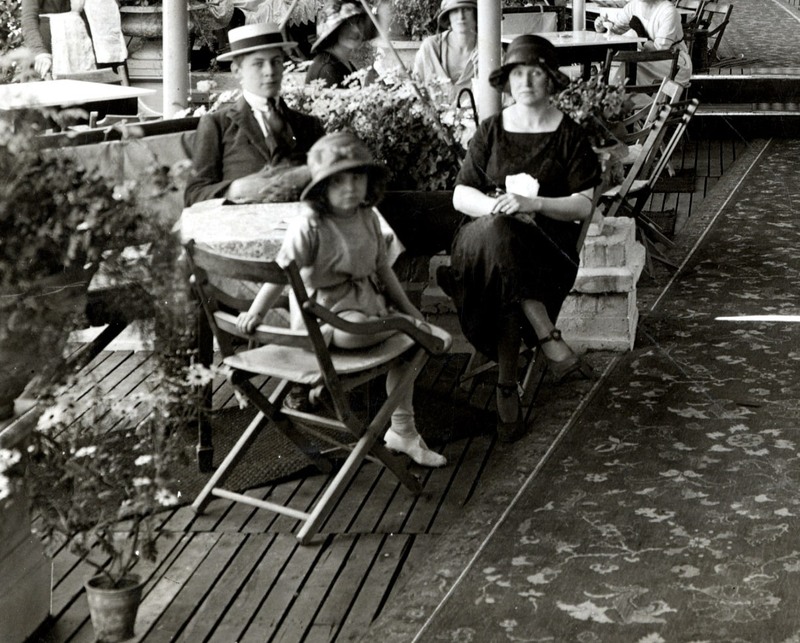 Today, let’s remember the hotel in its glory days as that young woman might have done. You might have expected me to mark the sad death of Mark Hollis, leader of the now reasonably obscure band Talk Talk with a few words. Talk Talk went from sounding like successors to Duran Duran to making avant garde, almost jazz-like music. I actually own four of their albums (bought during the era when Fopp Records sold back catalogue CDs at pretty reasonable prices), so this morning I put on Spirit of Eden, thought to be one of their best. Actually, I never really got it, despite many attempts. I was much more of a fan of David Sylvian, who trod a similar path from pop to avant garde, much more successfully to my mind. I hope he’s okay. 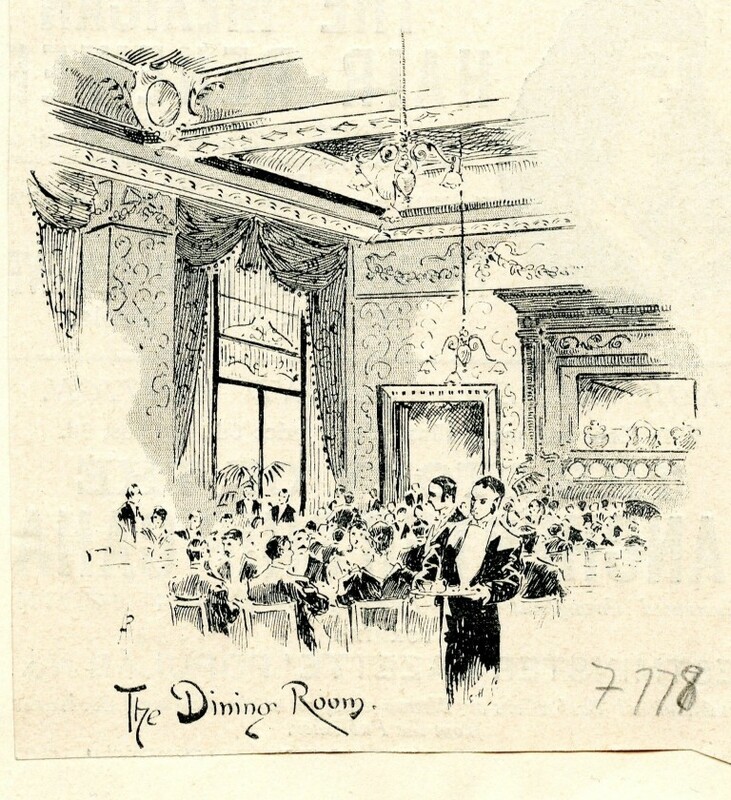 I wonder what the residents of the Palace Hotel circa 1894 would have made of either of them being played in the public rooms? I’m posting this quite late in the day at nearly 6pm. One of my regular readers (M) will soon let me know if there are any typos. 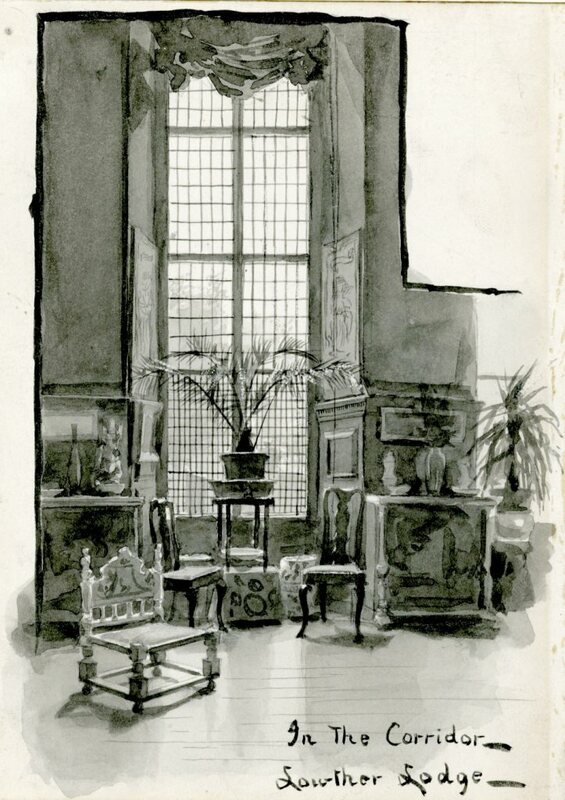 As I said in my first post about William Luker Jr, his illustrations to W J Loftie’s Kensington: Historical and Picturesque number over 300. So I haven’t covered all the best ones in two posts. There are still plenty left. In this case we’re following Luker inside various homes in the Kensington area. 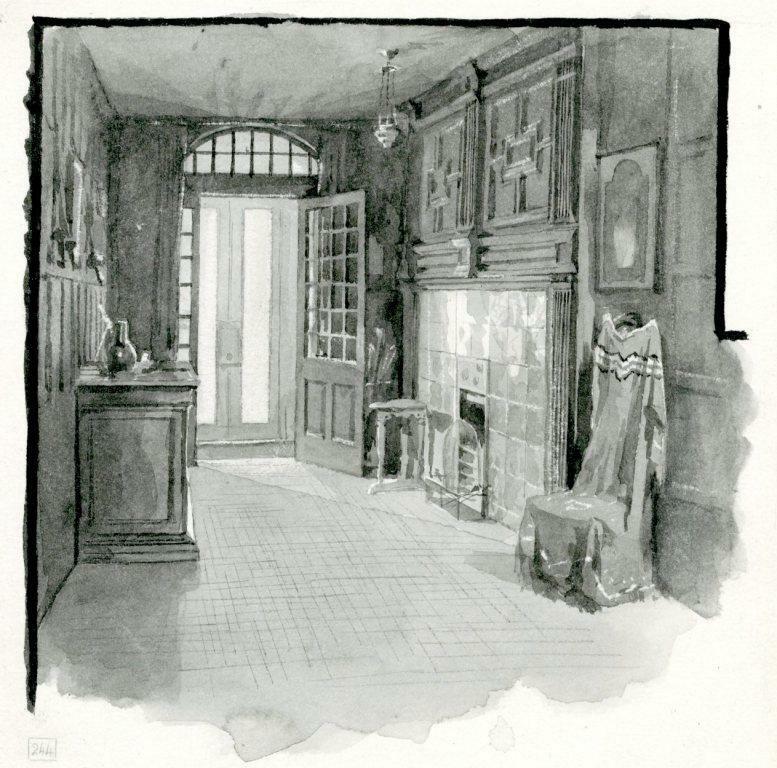 Light shines through glass panels in the door showing a hall with ornate paneling and a fireplace. Beside it a chair with a high back, over which is draped a robe of some kind. It’s these little details that always intrigue me. here’s another empty space. Also cluttered in parts, but quite spacious too. 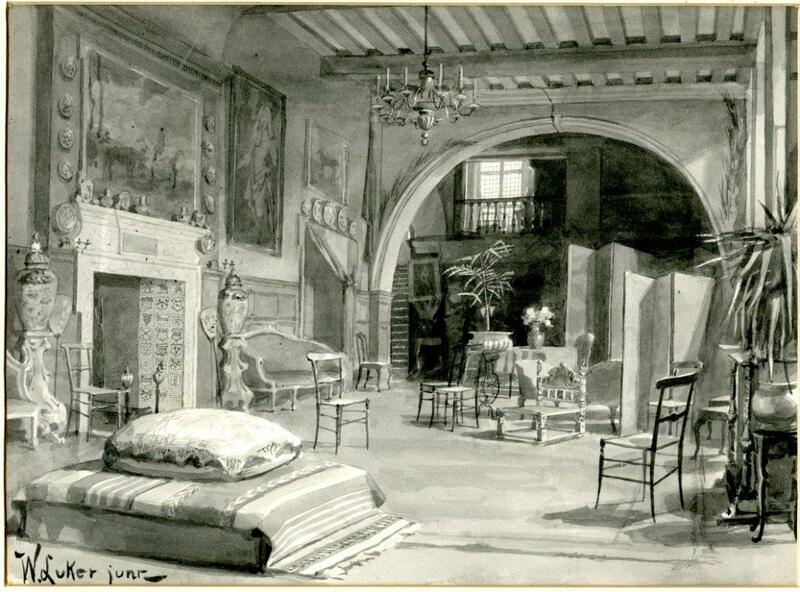 Luker had access to some luxurious properties, like this drawing room with plants and paintings. And this studio, currently unoccupied. With a large painting taking shape. Another empty hall, with a decorative floor. And eventually we see some people. 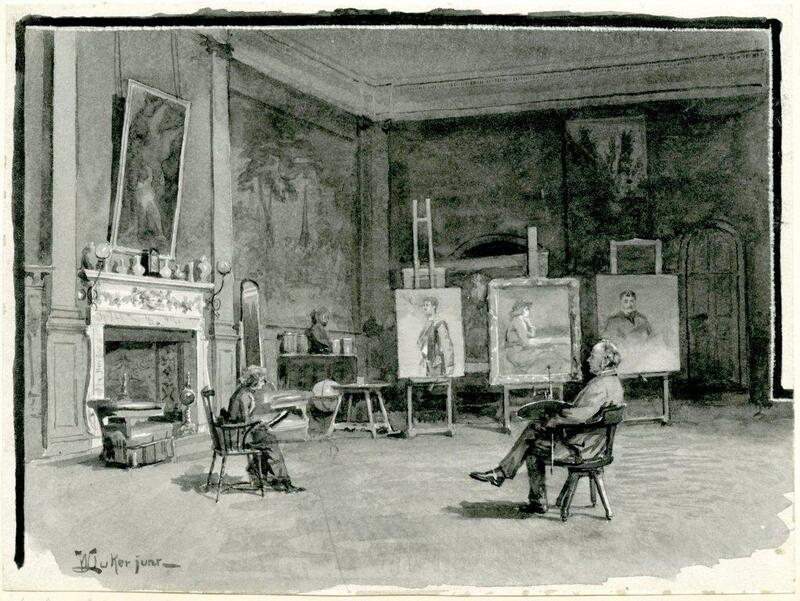 In this case John Everett Millais, posed with a palette in hand, facing his wife Effie. Below, another old friend of the blog. 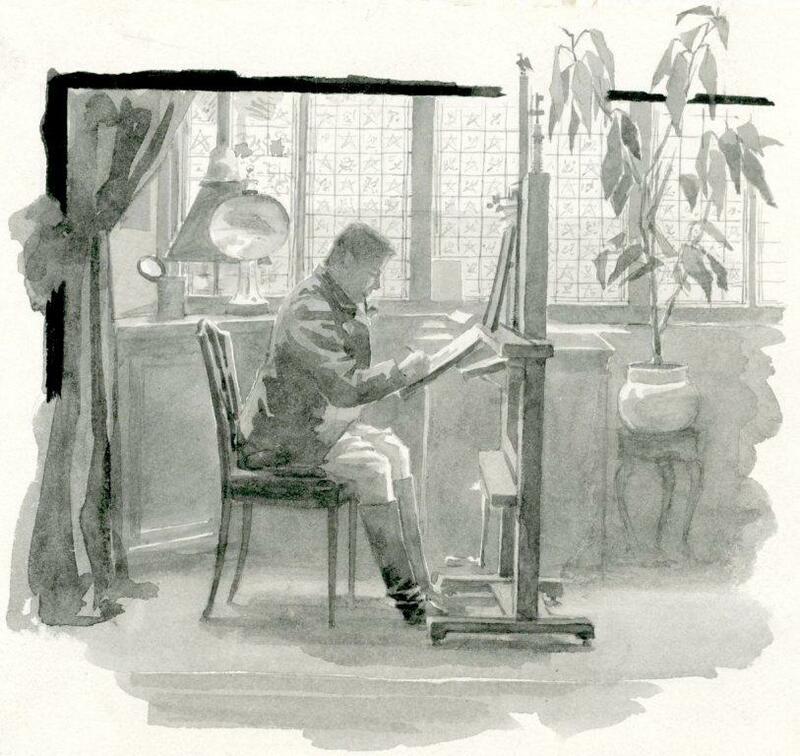 Edward Linley Sambourne, another friend of Luker’s. 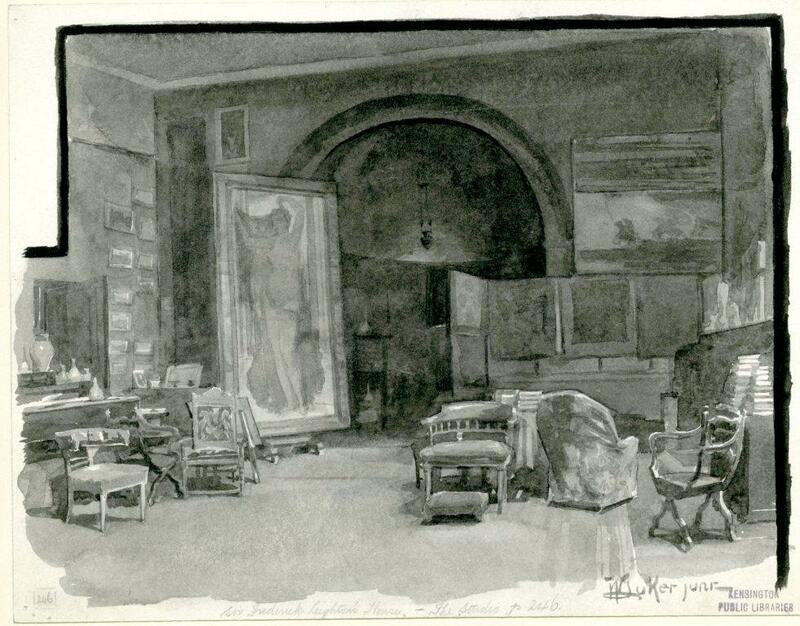 at work in his studio in Stafford Terrace. 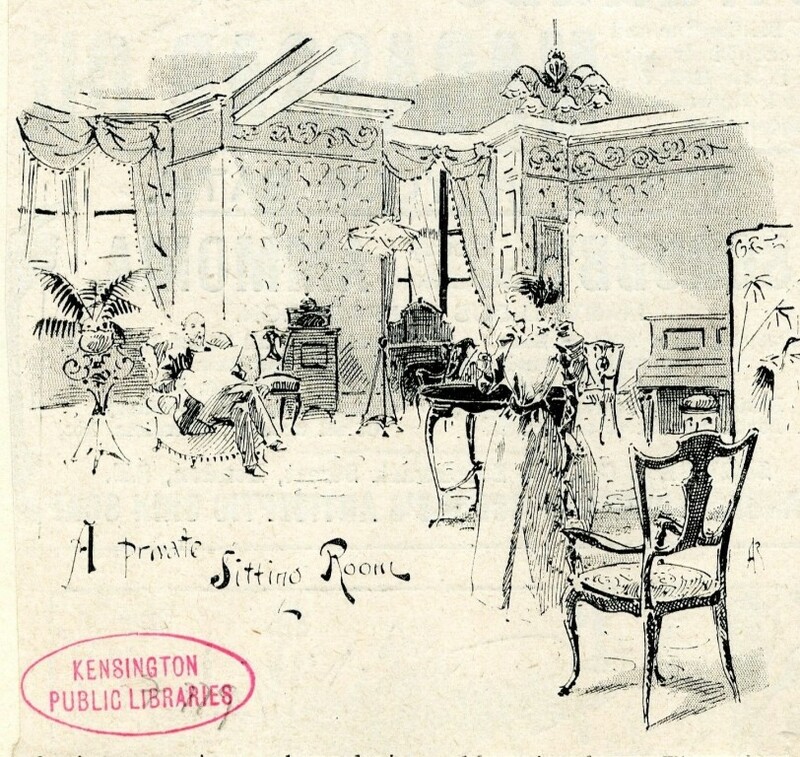 From empty or sparsely populated rooms to a room at the Kensington Vestry Hall which is filled with people and music. A musical evening. Some ladies removed their hats for the convenience of other audience members. Others kept them on, but people would have been too polite to mention the matter. 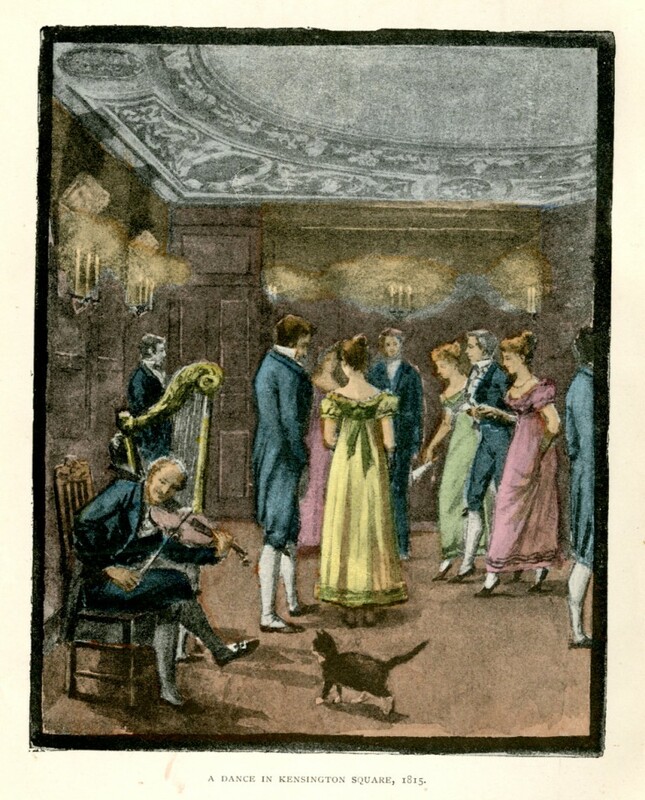 In the previous century, a less informal musical evening in a house in Kensington Square, coloured in for the published version of the illustration. 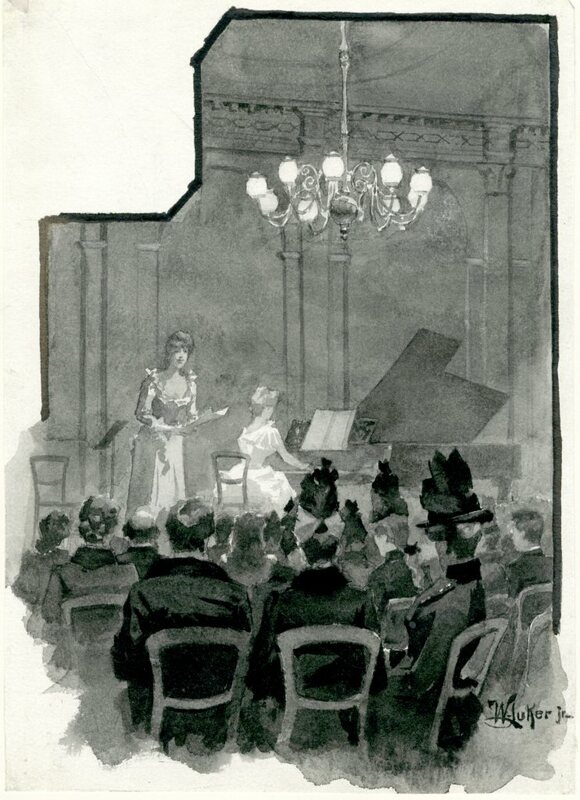 And in Luker’s “now”, hundreds of people in a room to hear a concert, at the Albert Hall. But I think he was happiest in a nearly empty room. 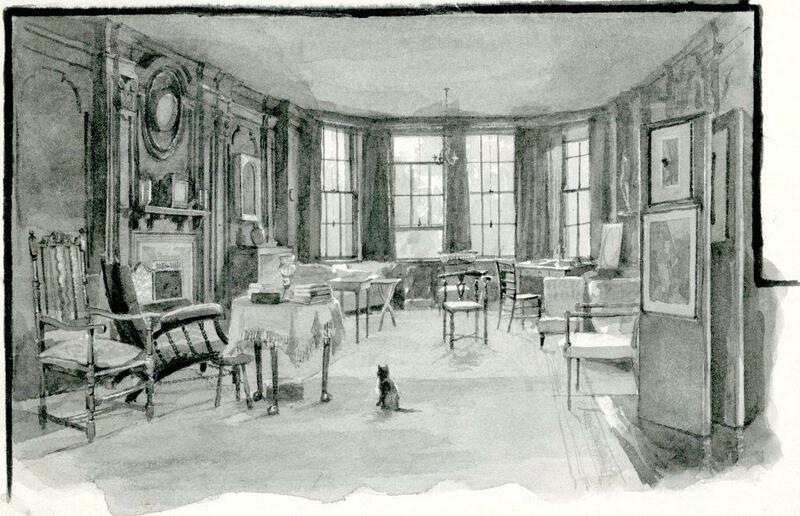 With just a cat, perhaps, checking the room for feline friendly refreshments. 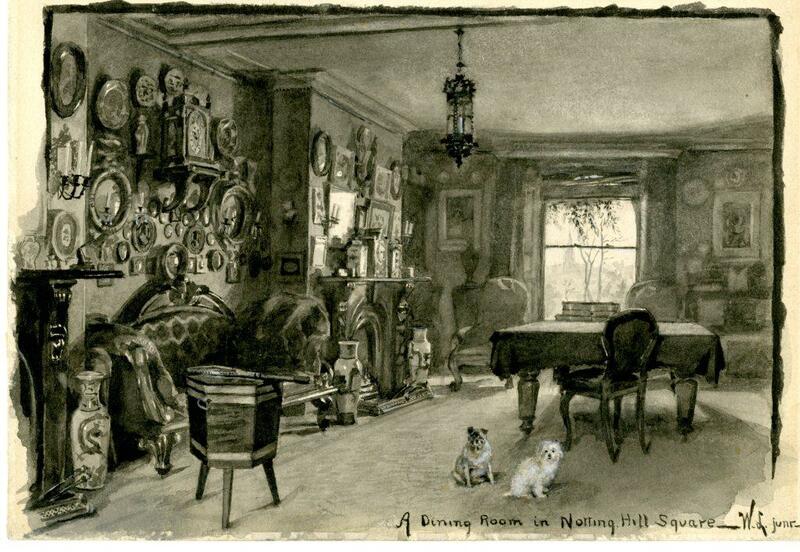 Or a couple of dogs in another cluttered room in Notting Hill Square. They look like they’re waiting for Luker to go so they can choose a sofa or chair in which they could relax. Finally, back at the Millais house. With a seal. Not a real one of course. It’s not Rossetti’s, after all. All these rooms could have had a story. I’m sure Miss Miranda Green could have been in many of them. She was very well connected. But she wasn’t here this week. Perhaps next time…. I’ve got a cold so I’m not very lively at the moment, hence the low word count this week. 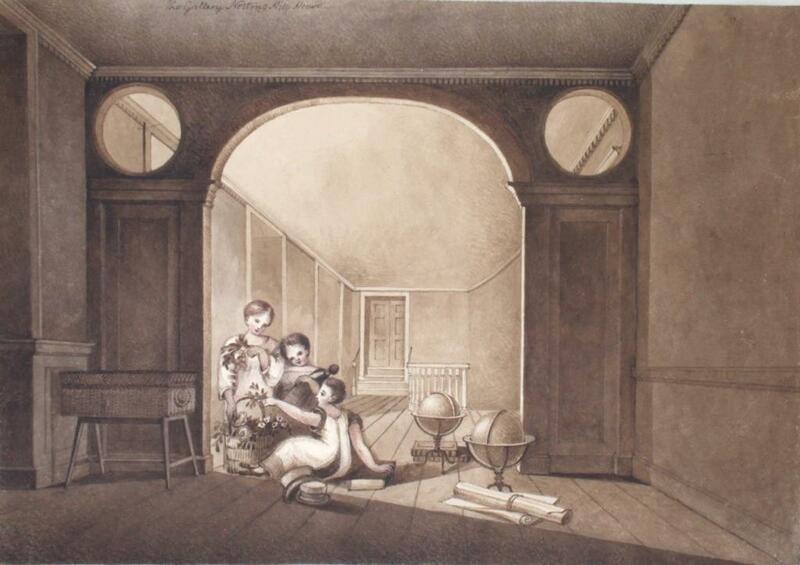 But Mr Luker’s pictures are usually evocative enough on their own. Kensington and Chelsea’s current Town Hall (construction images here) has been in use from 1975 onward. As we know from the recent post on its demolition , the old version was empty for nearly 8 years. So there was plenty of time to create a visual record of what it used to look like inside. 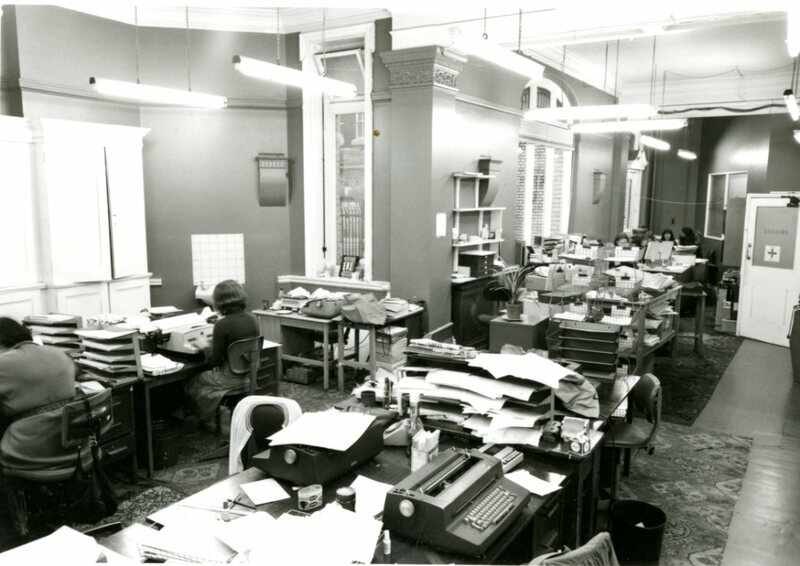 Some of the pictures in today’s post were taken in 1977, but some of them must be earlier as they feature scenes of office life. But in most case the building looks, or actually was, deserted. Empty spaces have a strange kind of charm, as we’ve seen in other posts. (Such as here, here or even here). These spaces are no exception. Here we look up at the skylight with a former Mayor framed by the elaborate banisters. I’m not sure who the other portrait depicts. 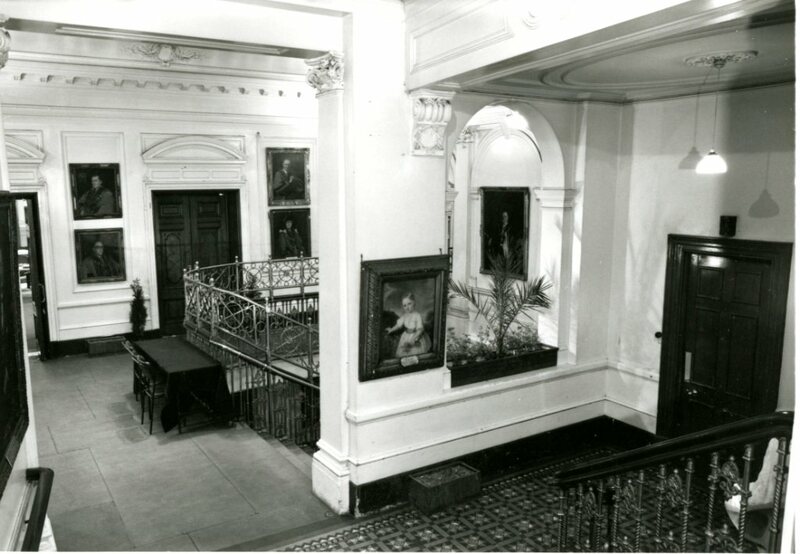 The third floor landing is actually referred to as the Portrait Hall. The pictures in the background are mostly more mayoral portraits. 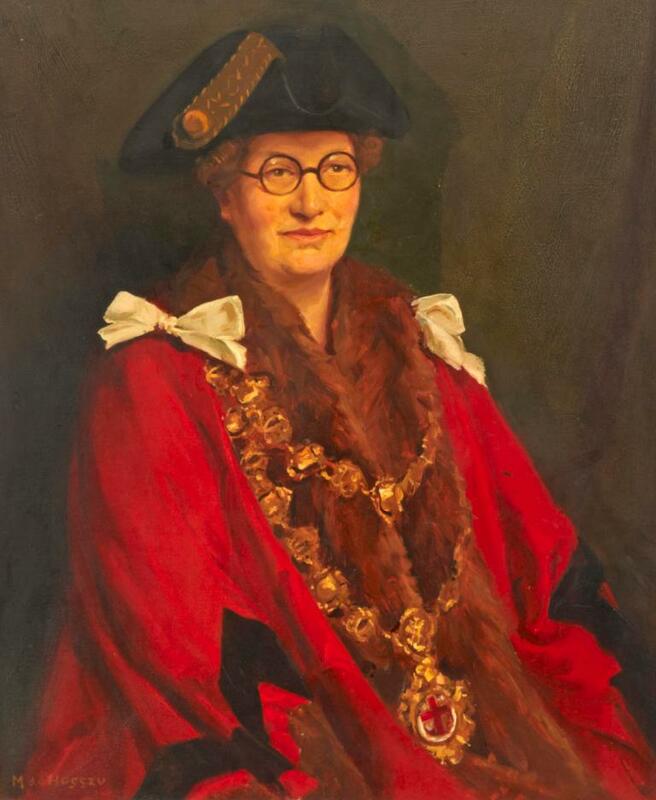 The bottom right picture in the group of four depicts Lady Claire Hartnell, Mayor of Chelsea about 1939, painted by Martin De Hosszu. This picture now lives in one of our archive rooms in a small section I call Mayor’s Corner. Some years ago many of the mayoral portraits were offered to the families of the individual mayors, so the collection, which must have been pretty big, was scattered. 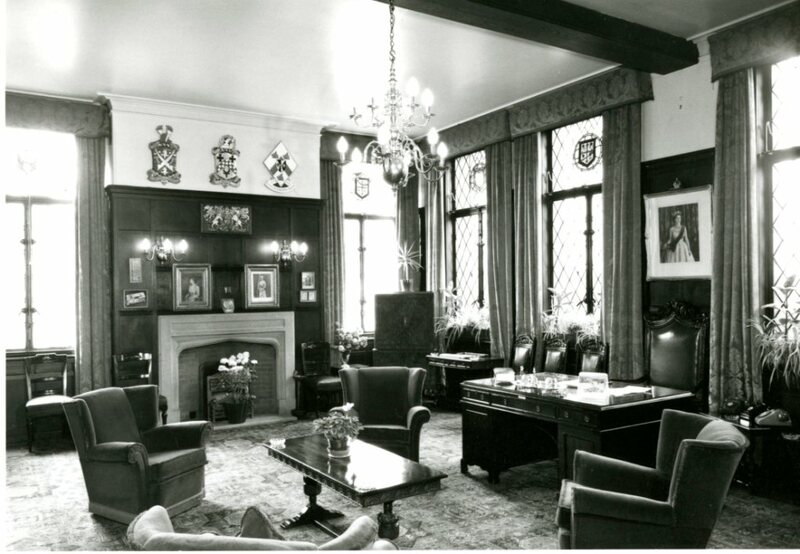 I don’t know if the Mayor’s Parlour was on the same floor as the portraits but it looks comfortable. 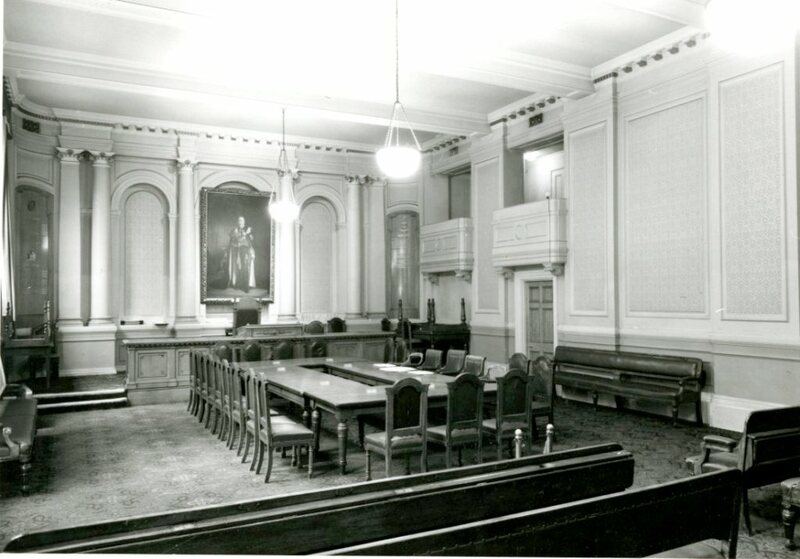 Below the third floor were the Council Chamber. And a slightly less spartan room for Lady Members. There were also more mundane areas. 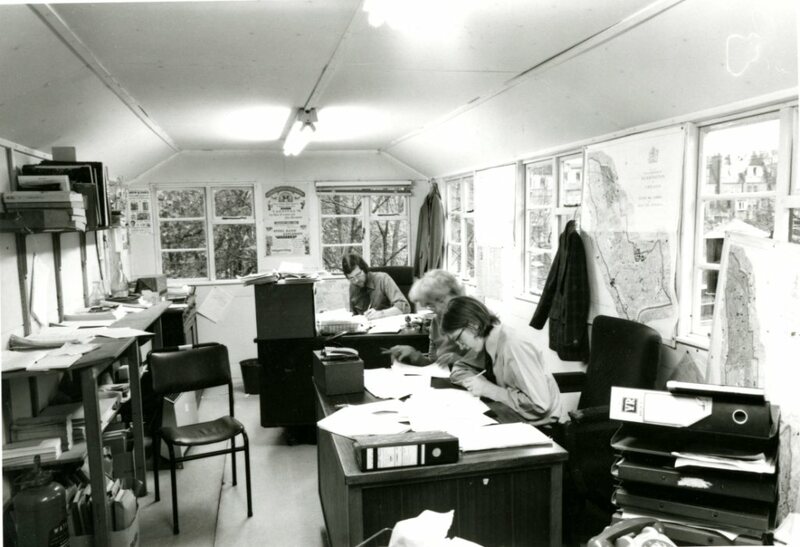 The Information Office. This would have been in 1974. The roof office. It looks snug. The typing pool. A phrase redolent of office life as it used to be years ago. Many piles of paper. Some of my colleagues would say that I still employ the piles of paper technique. In Local Studies, it’s hard to avoid them. 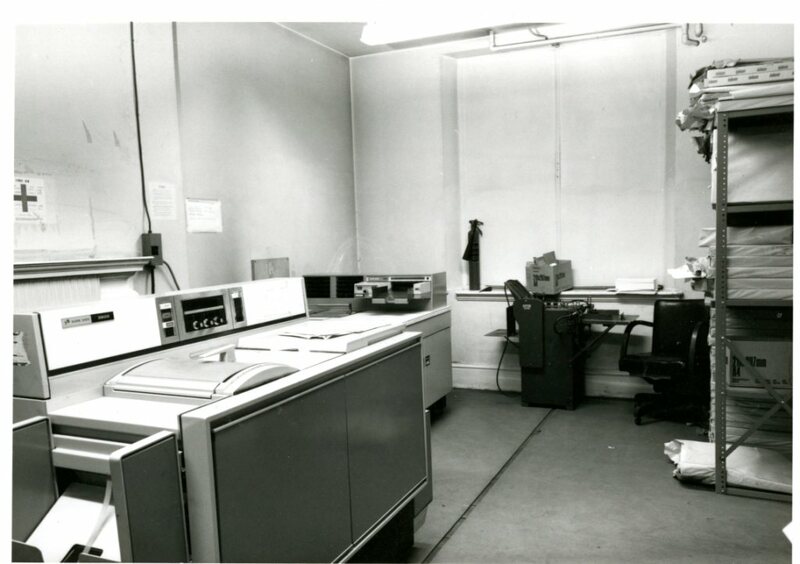 The photocopier room. Cutting edge technology at work. 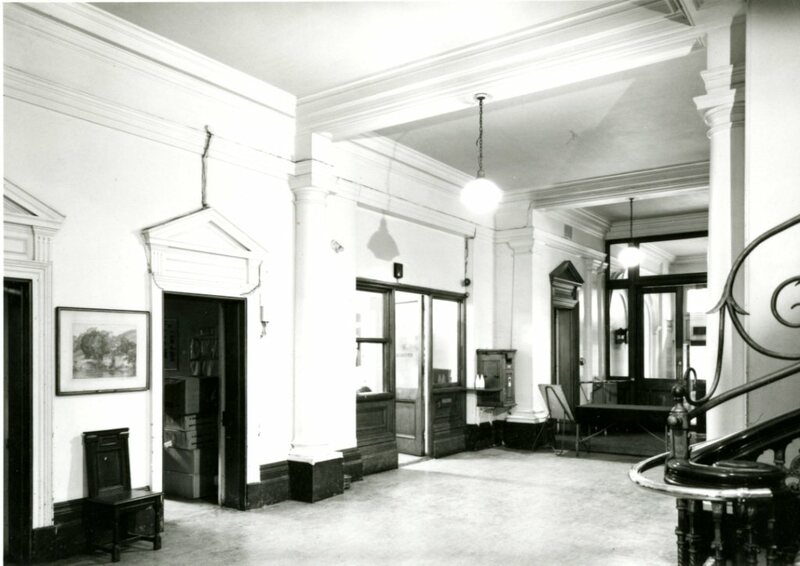 And, naturally, the post room. 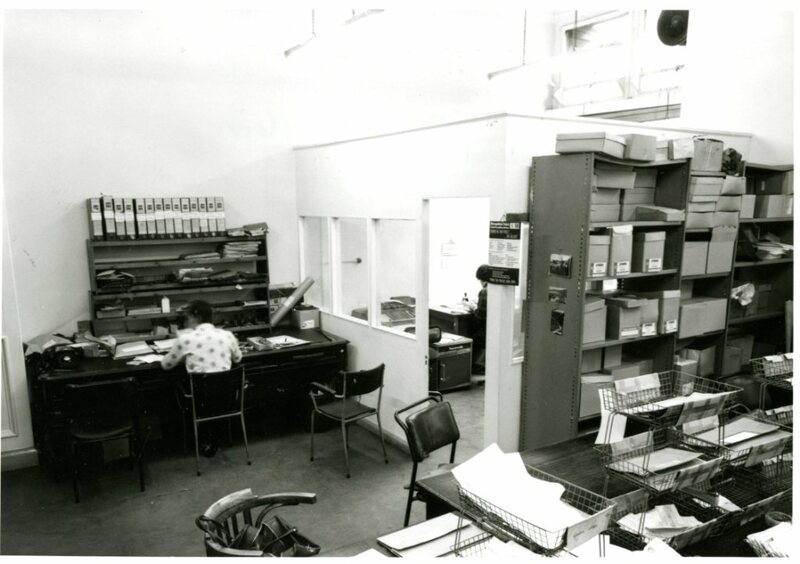 Any large organisation still has something like this, no matter how far we leave the old methods behind and move towards the paperless office. A fine collection of chairs. We’re not finished. 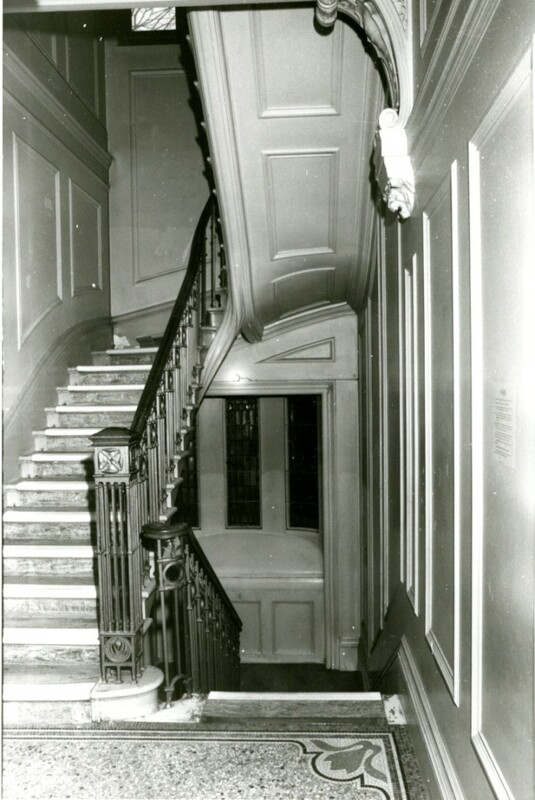 Back in 1977 there was this less grand back staircase. It looks like something in a ghost story which is appropriate as it may possibly have taken you downstairs to see this. 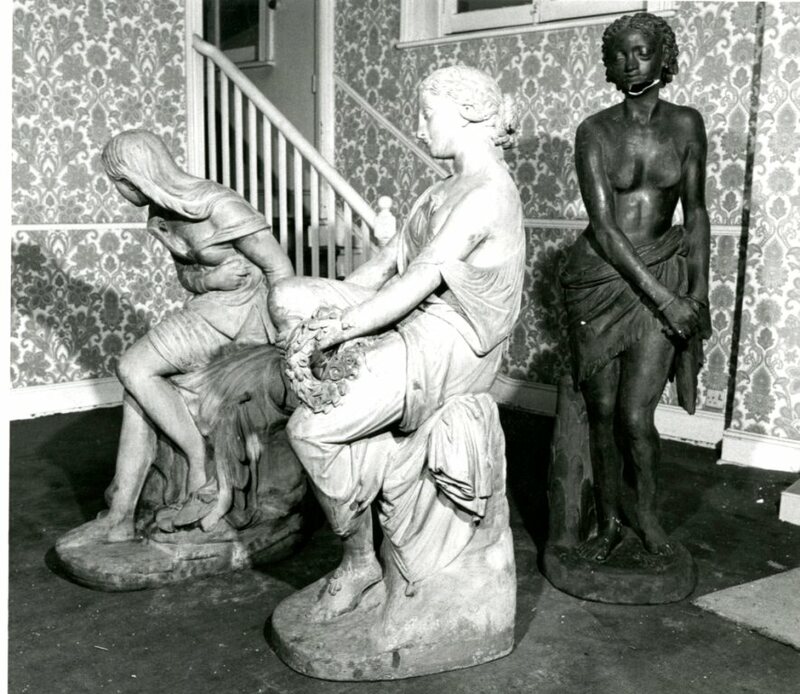 A gathering of plaster statues (you can see one has suffered some damage to her chin). I don’t know what became of this trio of unrelated ladies. We have a few plaster statues and busts in our collection and they’re quite easily damaged so you have to be careful with them but also accept a certain amount of wear and tear along the way. They often end up in basement rooms. Perhaps this group were waiting for transport to a better place, where they would be properly revered. This was a bit of a marathon, but it’s one of those topics that once you’ve done it, you’re probably not coming back to it. Sometimes Isabel or I write a post on a subject and we know that this is now probably the definitive word on that subject e.g. the West London Air Terminal. This is not because we know more, but because we can bring together text and images in a way others perhaps couldn’t. And in the case of the Air Terminal and Isabel’s Paddington series, we also provide a way for former residents and employees to reminisce about these places which are no longer with us. So, although the history of municipal buildings is not for everyone , this post does preserve the way the old Kensington Town Hall used to look. Some people remember it fondly. Some of the ideas I had for short posts didn’t quite work out in practice so for this last one I asked myself the question: can I make a post out of a single picture? To start with, here’s a nice family group. A couple of the waitresses, and the singers in their nearly matching dresses. That woman whose face we can just see in front of them might be sitting at a piano. Two young ladies are glancing up at the photographer from under wide brimmed hats. Look up at the many treats on offer such as the Parfaits at 1s/3d and the New Jersey Sundae, just a shilling. Order from your waitress who will bring it from the counter. That may be the entrance to a lift behind the curtain. The photographer has the patrons’ attention but are they all quite willing to pose . This is an exclusive establishment after all, and being photographed in it is a sign of distinction. A couple of .gentlemen at the back, but on the whole this is a place for the ladies. On the other side of the aisle more ladies enjoying afternoon tea, more waitresses in their black headbands and another selection of treats. This is the whole picture. 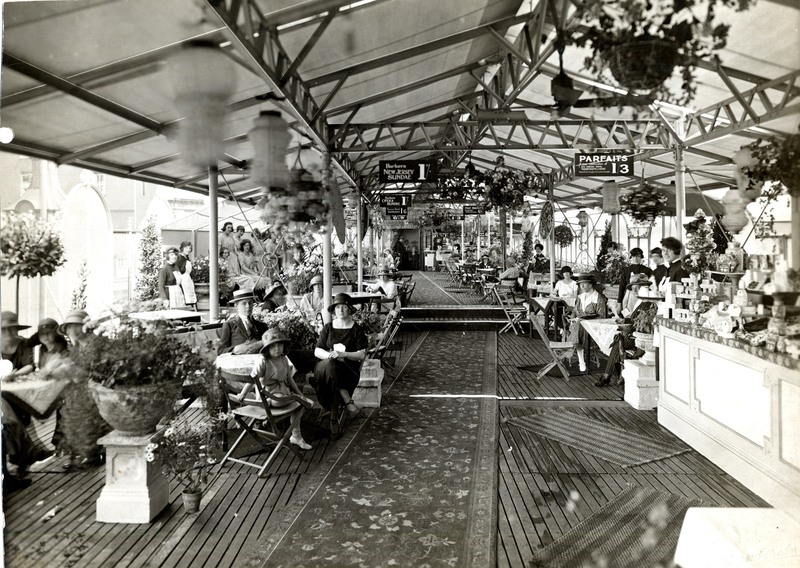 The terrace garden at Barker’s department store, sometime on a long leisured afternoon in the 1930s. Make the most of it, ladies and gentlemen. Bern, Chloe and Suze exploring the archives. And finding a few spots to perch on in the manuscript stacks. From them and me, a happy Christmas to you all. 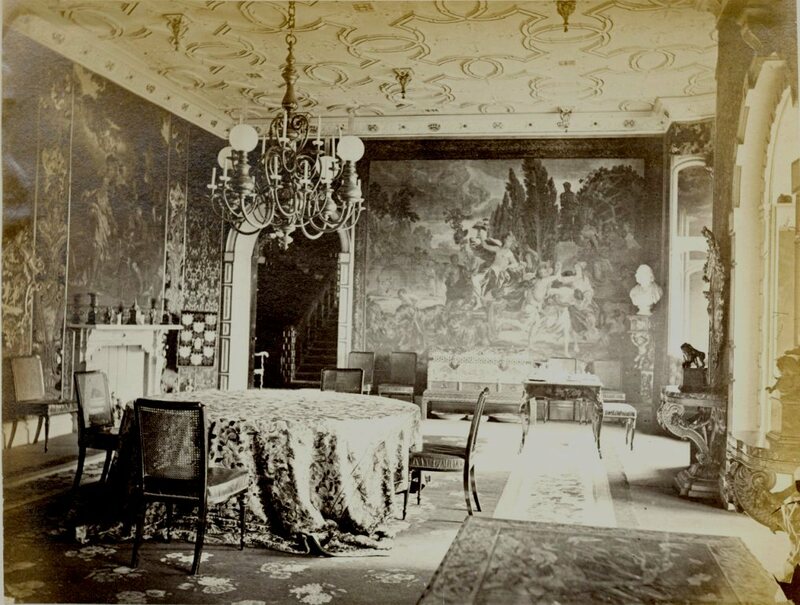 I scanned today’s pictures in response to an enquiry about busts inside the former Holland House. 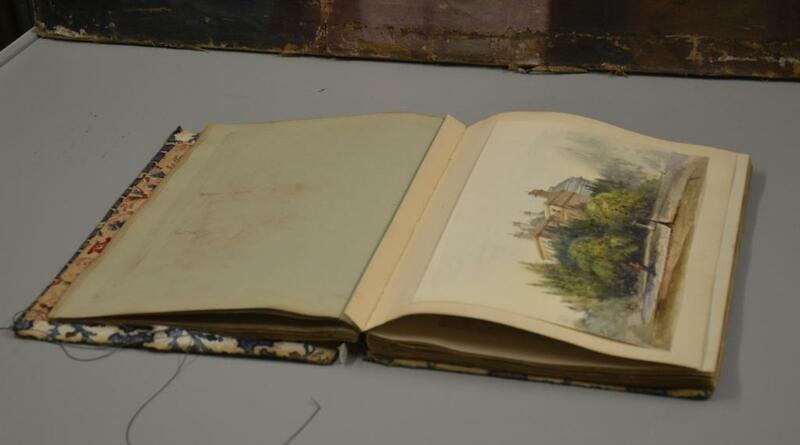 We have an album from the 1880s with some views of the interior taken before a bout of redecoration. On another occasion I might have scanned the whole album which could have resulted in a full length post but I didn’t have much time so I only did a few. I was particularly intrigued by the conservatory. 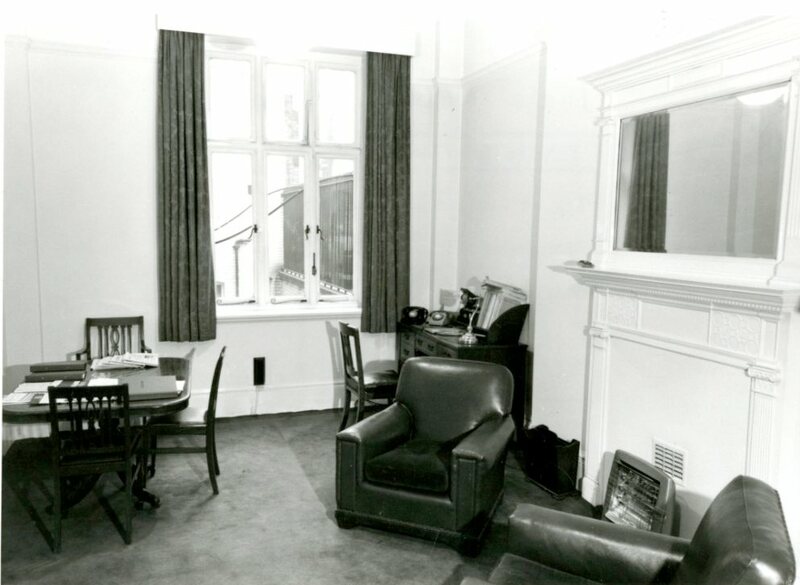 This was Holland House at the time. The east front with, a couple of guys standing patiently in front of it to add some local colour. At least one of them might have come from breakfast. 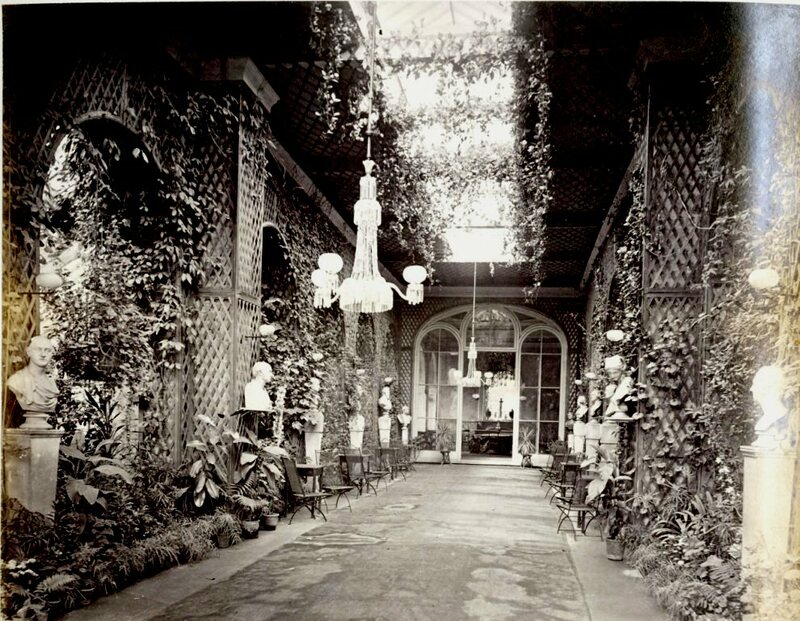 This is the conservatory, looking back into the house. A pleasing number of busts are on view, and some convenient chairs in which to sit and contemplate the outside while inside. 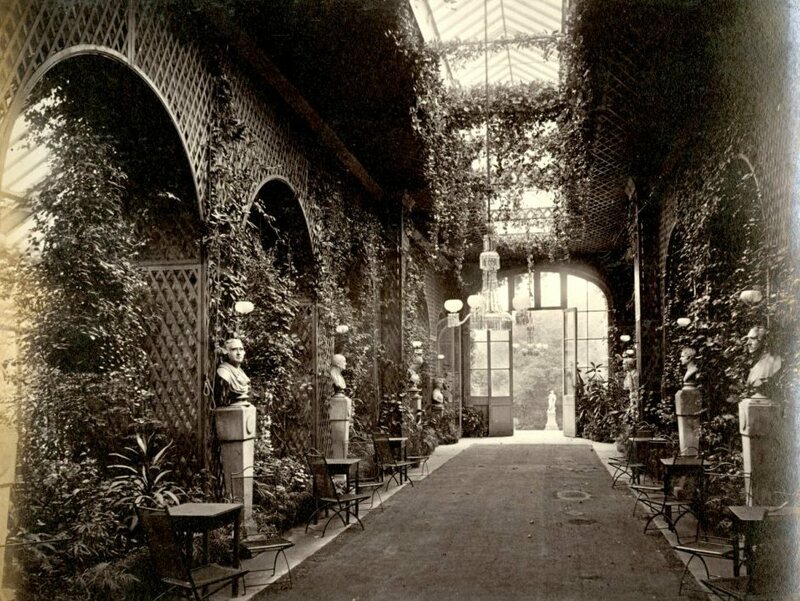 You can see another Kensington conservatory near the end of this post. This is the view looking in the other direction into the garden, You can just make out a full length statue in the daylight. Wouldn’t you want to sweep through the conservatory after that nice breakfast and tale a turn in the grounds? You can’t walk through this space anymore but the grounds are still available for all, winter and summer. And out in the park. I was checking the link above to an earlier post and was reminded of my Christmas 2013 post about Irving and Caldecott’s Old Christmas. 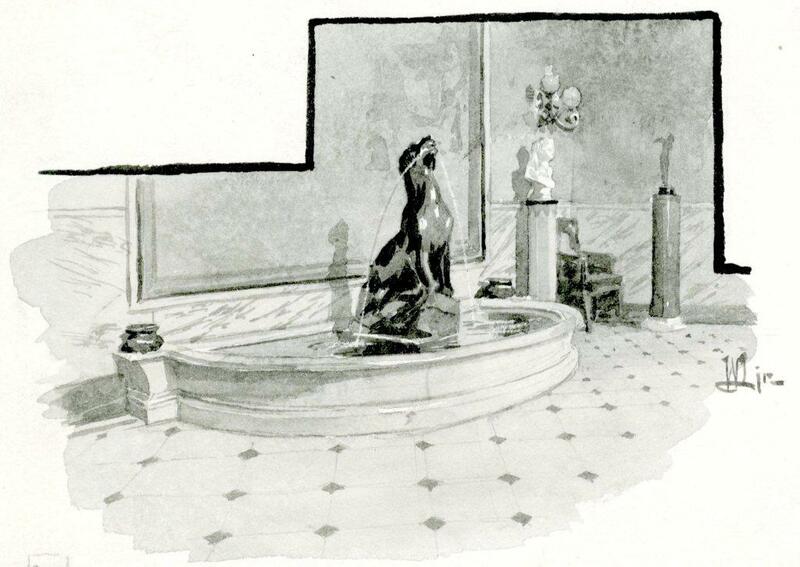 That was one of my first posts about book illustration, and Caldecott was a contemporary of our friend Hugh Thomson. Check out a traditional Christmas here. 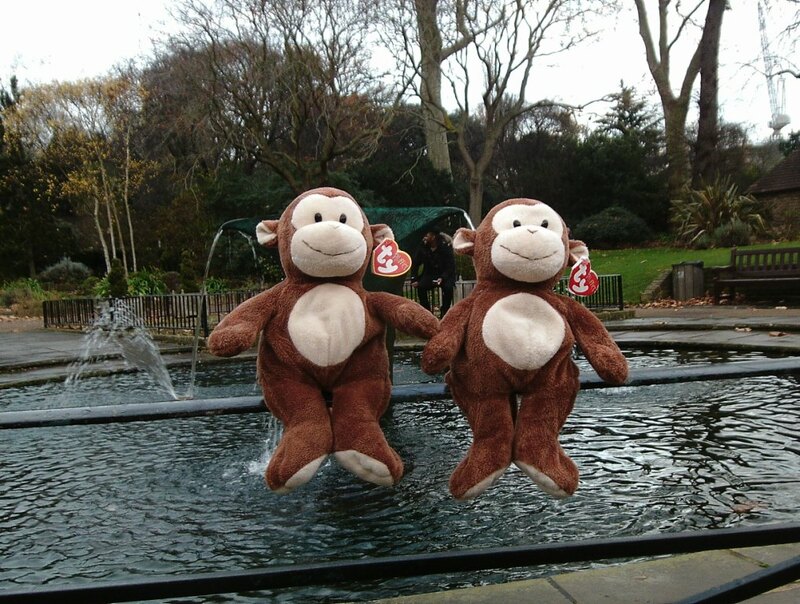 Another short post, and more monkeys tomorrow. 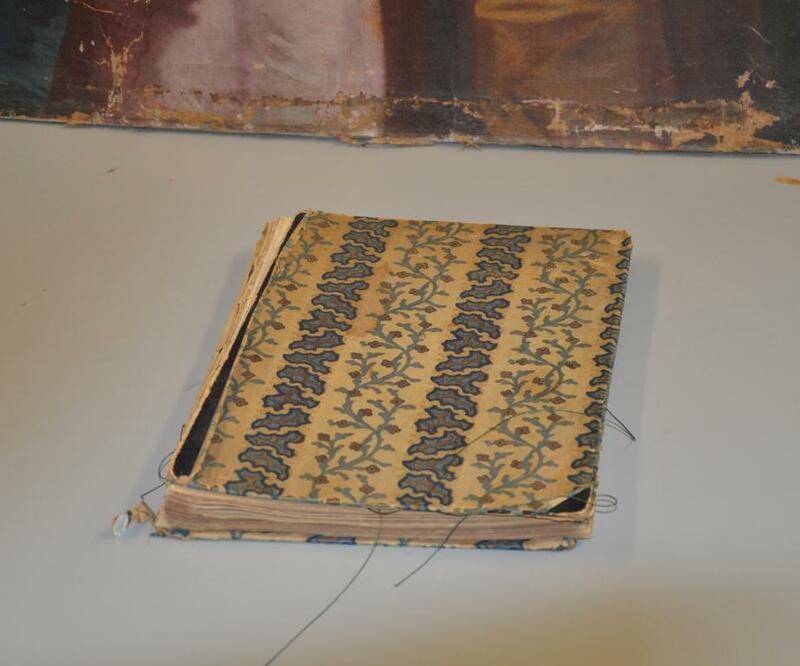 Louisa Boscowen Goldsmid’s album is a threadbare scrapbook with a stained fabric cover. Inside it are a set of watercolours. 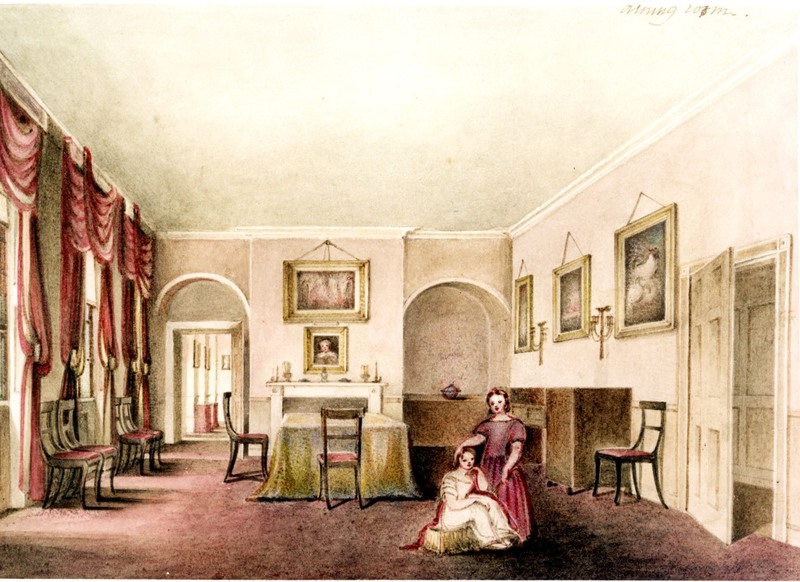 Mrs Goldsmid was clearly an amateur but like other amateur artists featured on the blog what she lacked in technique she made up with a kind of quirky charm, and a sense of atmosphere. 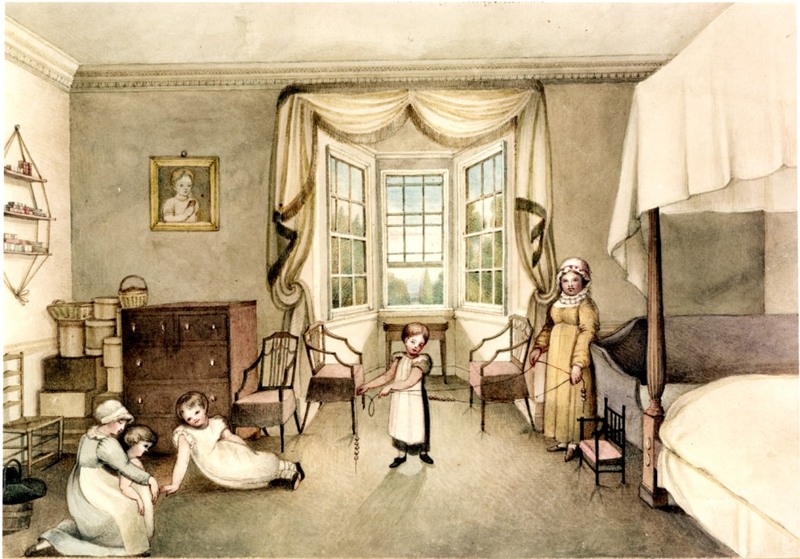 Louisa lived for a short time at Aubrey House. 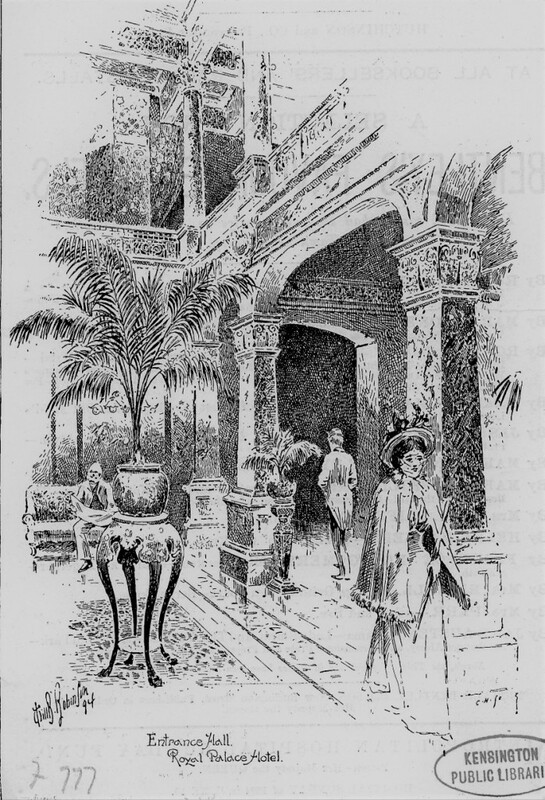 This is the house in 1893. 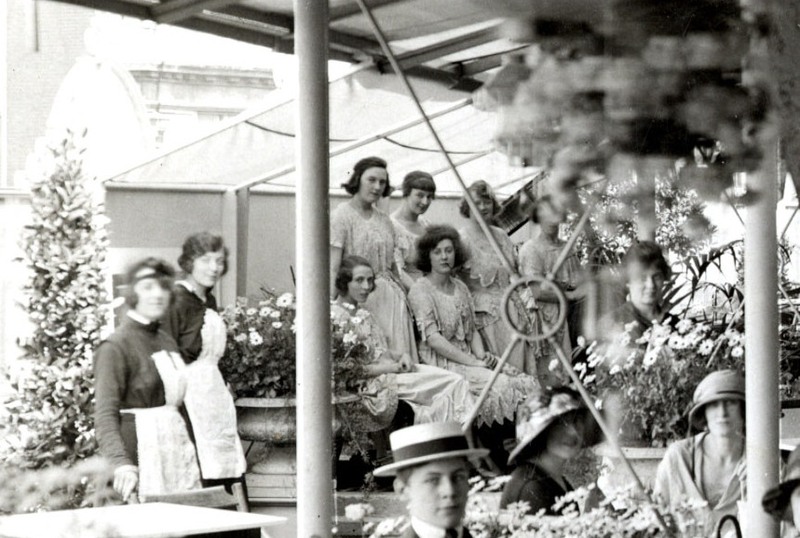 Some young members of the Alexander family pose listlessly on the rear lawn. 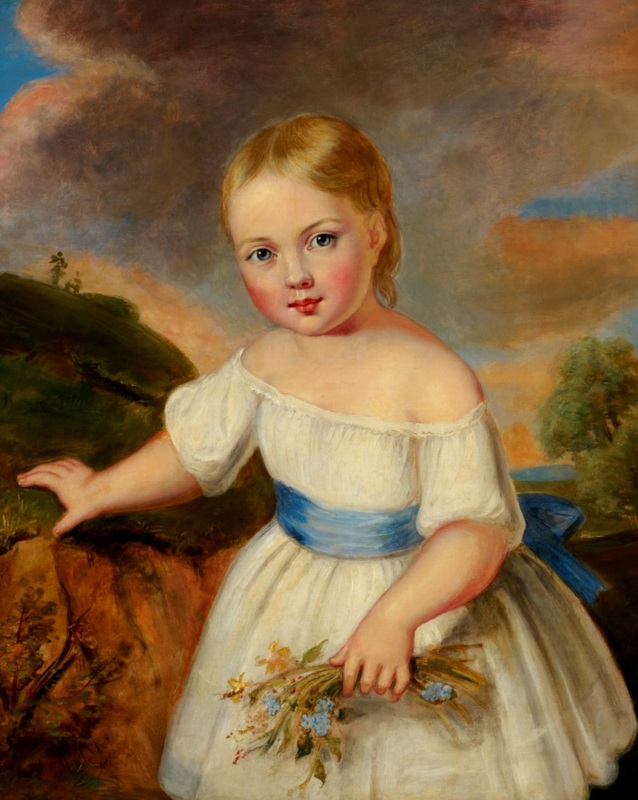 Louisa was still alive by then but she belongs to an earlier period of the house’s history. 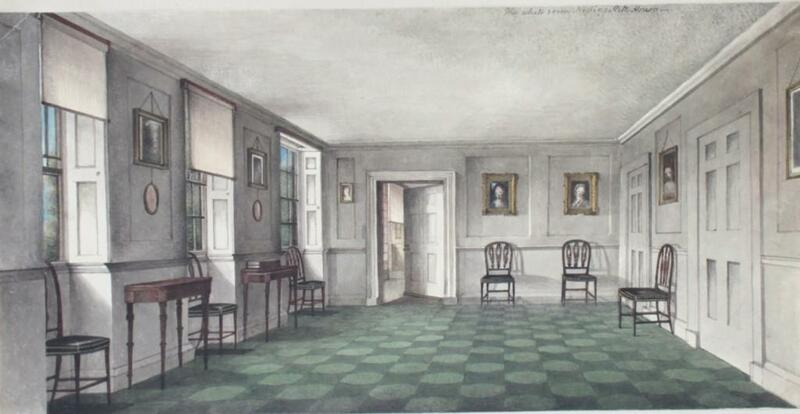 Mrs Goldsmid’s pictures are noteworthy in our collection because they depict the interior of the house as fully furnished and inhabited (which doesn’t always happen in pictures of late 18th/ early 19th century interiors). 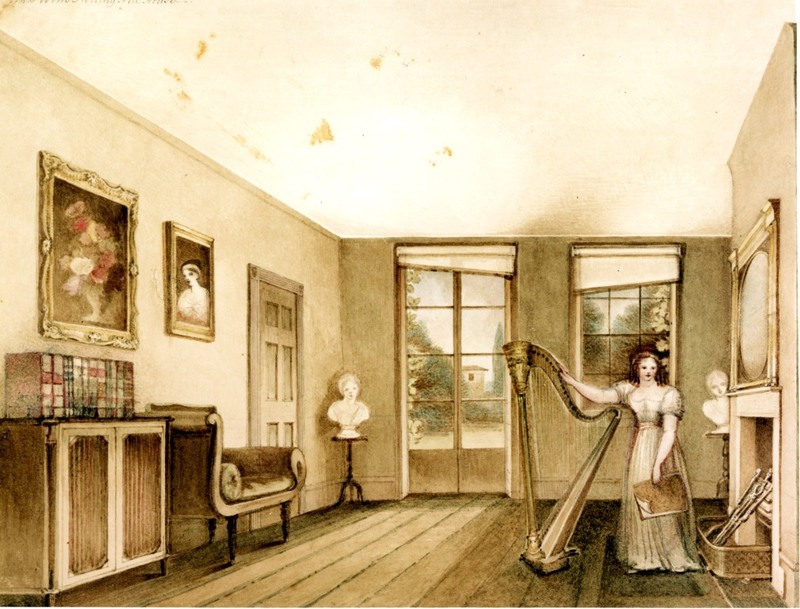 Here in the pink room Jane de Visme poses with her harp. It must be admitted that things look a bit dull in the nursery. But the children seem to have found better amusements in the gallery. The children are lounging around at the top of the house, away from parental interference. With a parrot on the lookout. Downstairs, the ladies engaged in more elegant pursuits. The picture itself is quite elegant with the ceiling design reflected in the tall mirror, and a pair of open doors showing the rooms beyond. The de Vismes had left by 1819. Other tenants and owners followed. 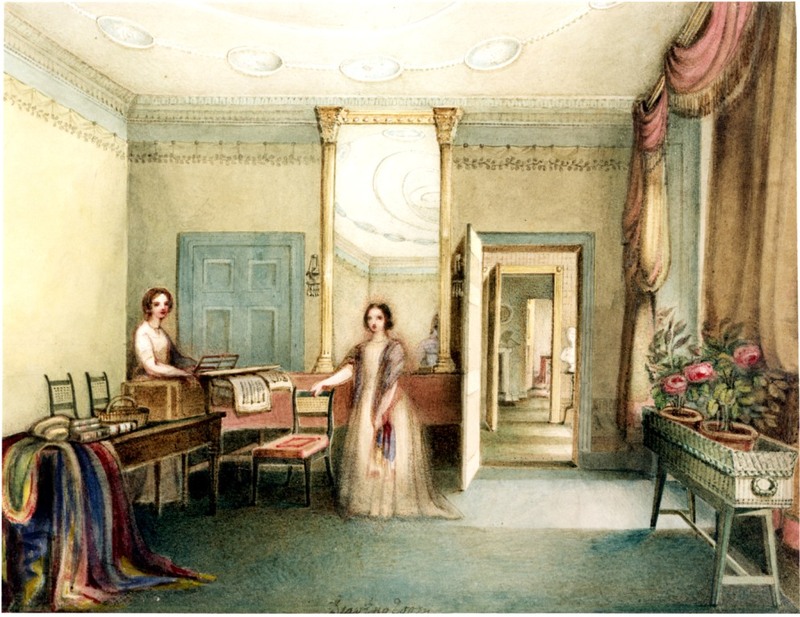 From 1830 to 1854 the Misses Emma and Caroline Shepheard ran another school for young ladies at the house. 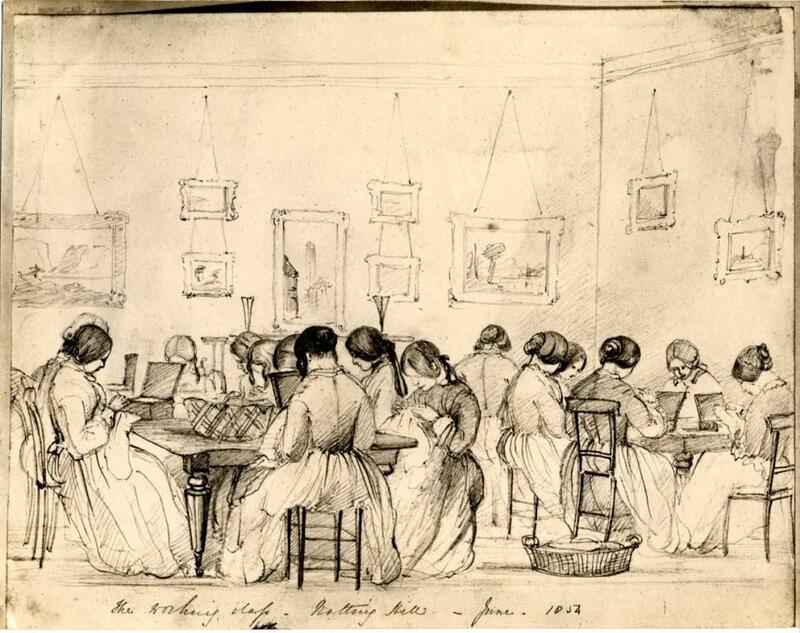 Miss Euphemia Johnston (one of the pupils) sketched them “in mysterious conference” in 1853. 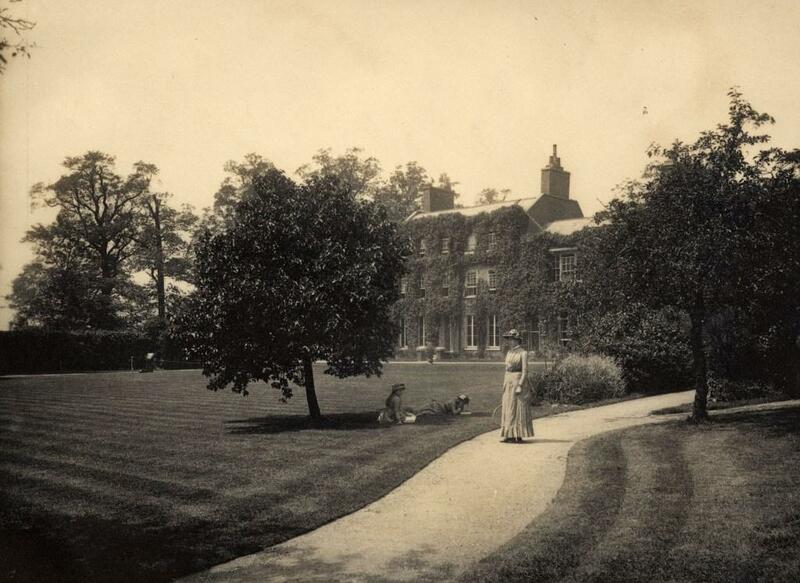 Florence Gladstone who wrote a history of Aubrey House reports that the picture “bears little resemblance” to the “very attractive”sisters. This picture, also by “Effie”, shows the students hard at work. Heads are bowed, work baskets are open, and possibly a couple of laptops on the right. 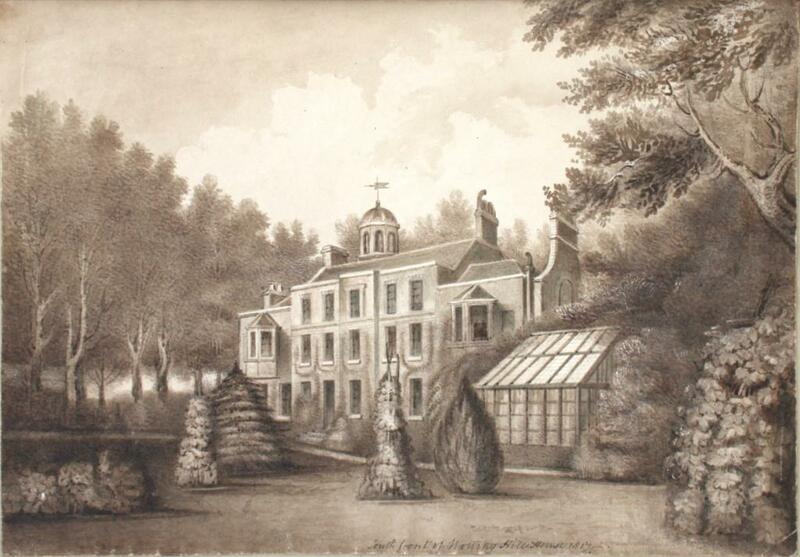 After the sisters the property was sold and the grounds “somewhat truncated” according to the Survey of London (who were refused access to the property during the preparation of their volume on Northern Kensington). This was the period when the name Aubrey House was adopted. 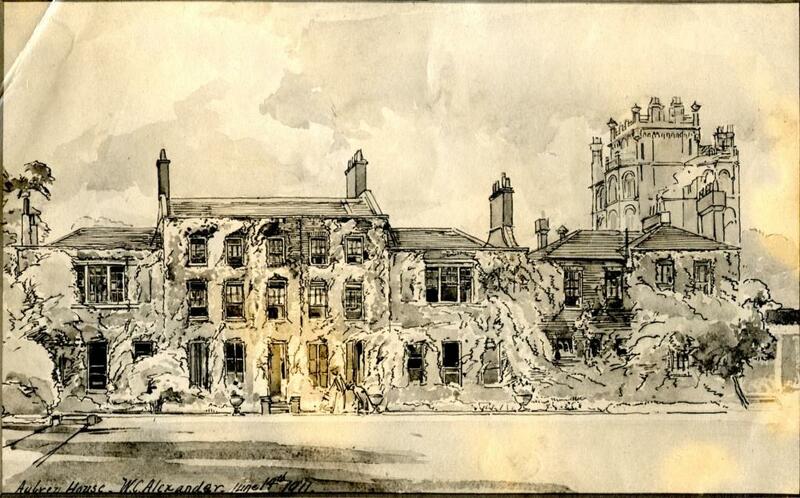 In 1873 the house was bought by William Cleverley Alexander. The house remained associated with his family for nearly a hundred years. Maybe even this one, Jean Alexander, photographed in 1906. 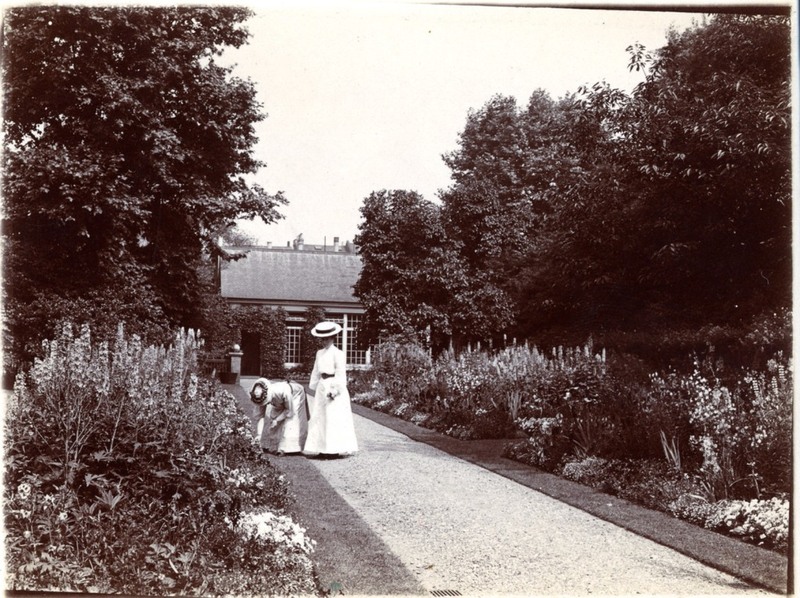 Or one of these two ladies walking in the garden. 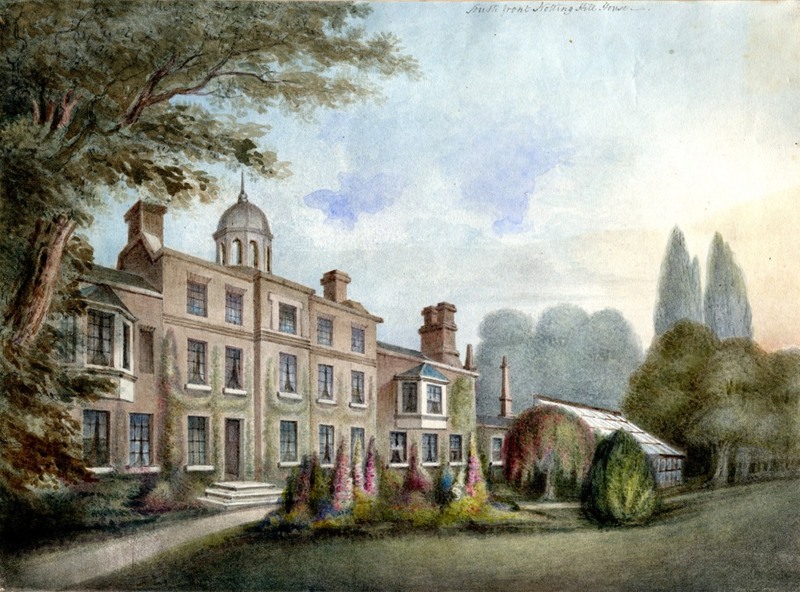 I first had a good look at the Goldsmid album while some researchers were looking at the history of Aubrey House for a forthcoming book, which I await with interest. In the meantime I thought the time was right for a look at Louisa’s pictures, although as it turned out, that was just a jumping off point. We will return to the further contents of the album at some point in the future. 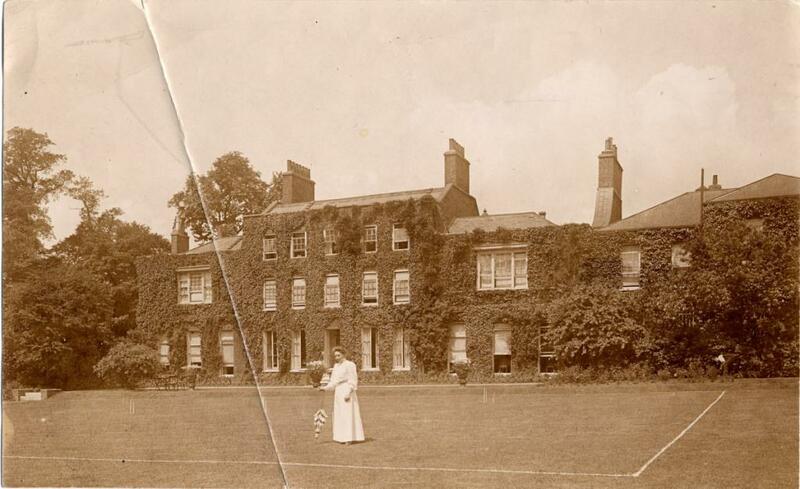 Florence Gladstone’s book about Aubrey House is a bit of a confusing read so I hope the facts and quotes I’ve extracted from it are accurate.She also wrote the first history of North Kensington, Notting Hill in Bygone Times in 1926. 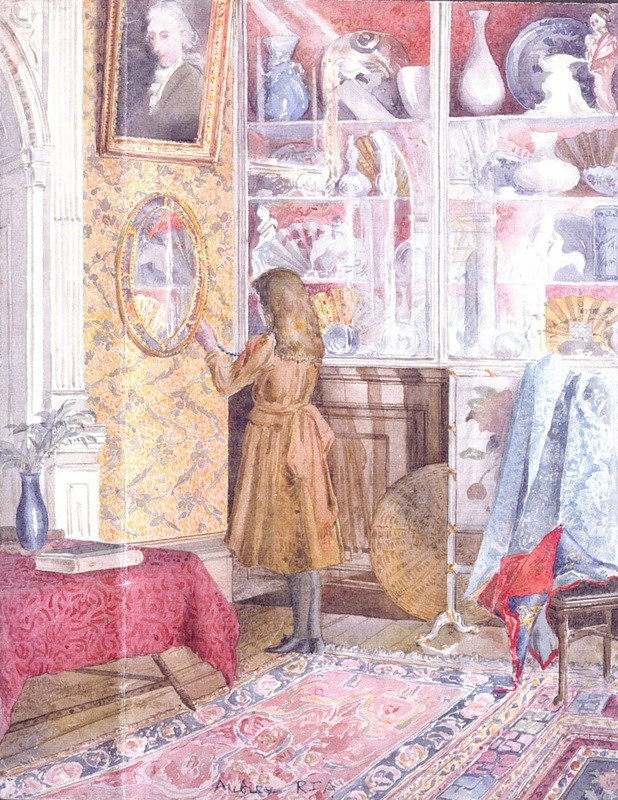 Posts about two of my other favourite watercolourists , Marianne Rush and someone we only know as the Artist of the Red Portfolio might also be of interest. 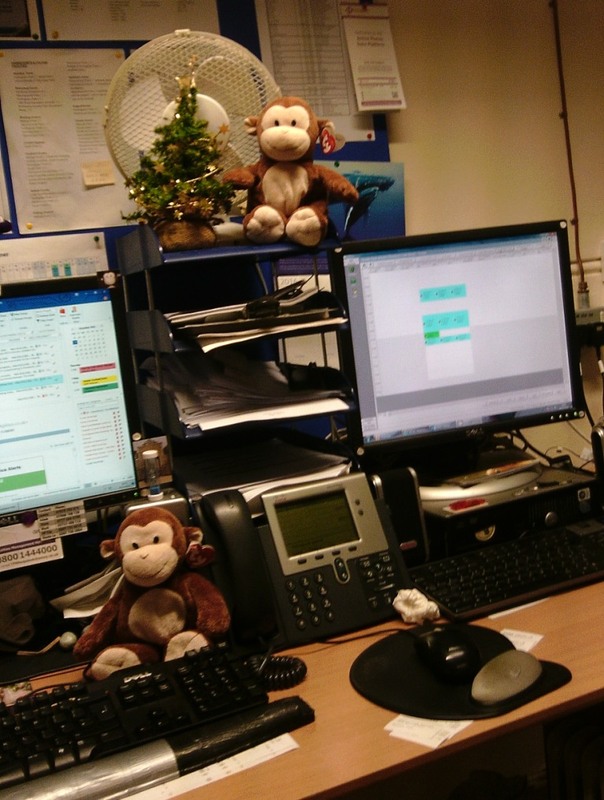 The computer that was giving us grief has now been restored to a semblance of its former self so we can scan again. Thanks to K. I’ve still got drafts of a couple of odd posts which I may still use.